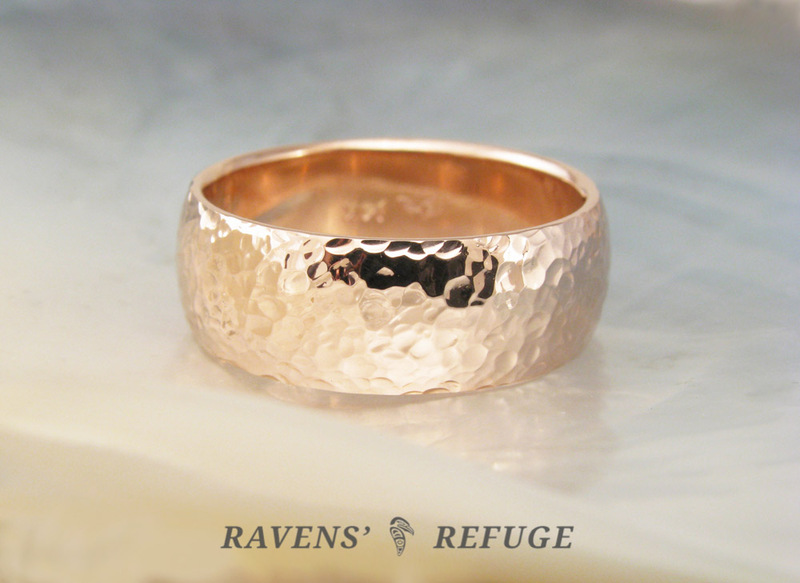 The “anvil” style exemplifies cold worked, hand forged metal. 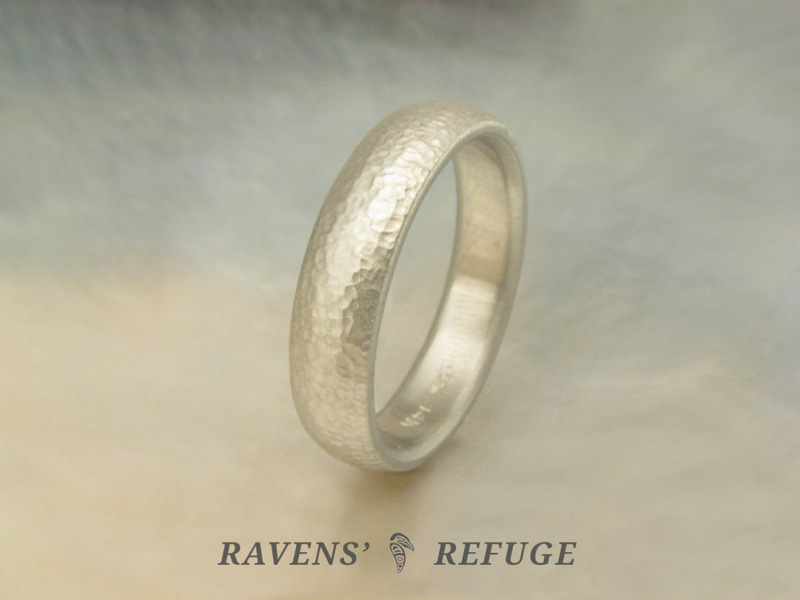 Its texture is subtle, providing visual interest in a modest, earthy way. 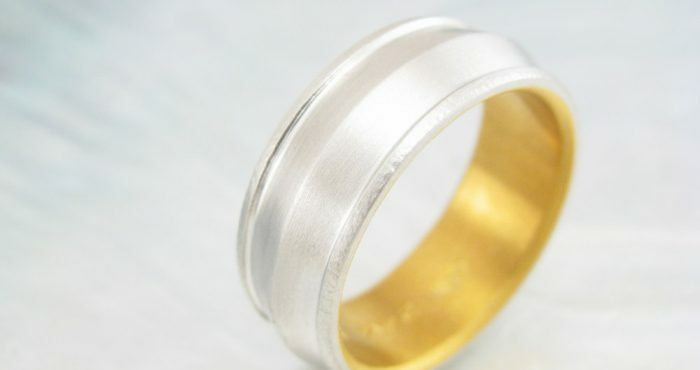 The anvil style offers a happy medium between the aesthetic of a traditional smooth band & that of a less conventional hammered band. 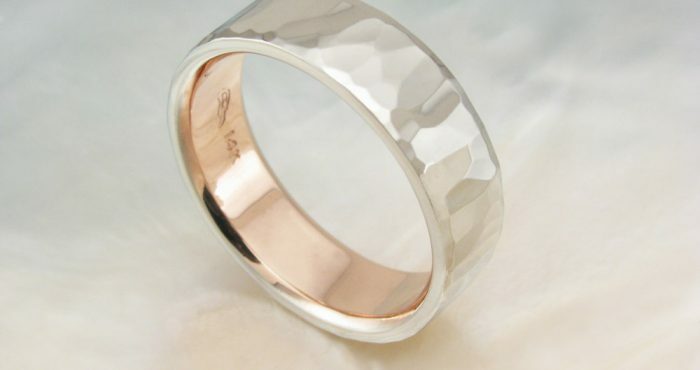 This style is available only for domed bands. 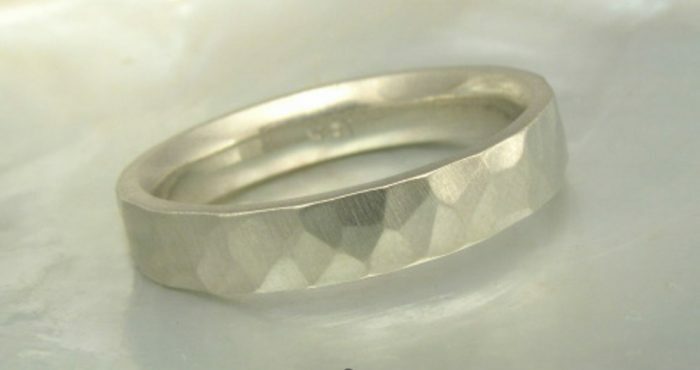 The arrowhead style is similar to cobblestone, but its facets are longer and more angular in shape. 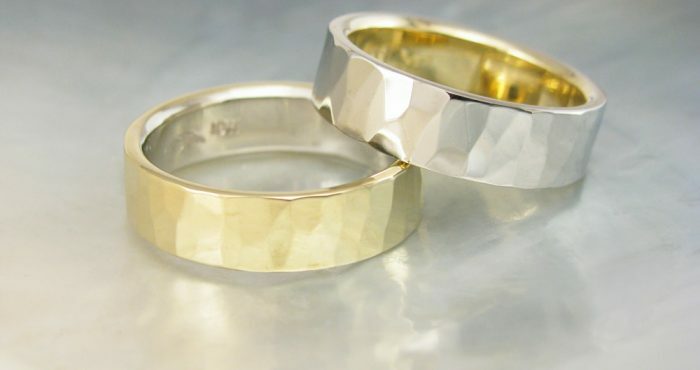 With a satin finish, the arrowhead band shimmers; and with a polished finish, the sparkle really pops. 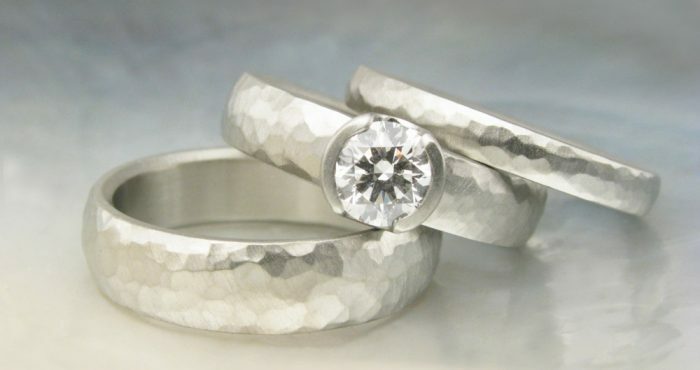 "Arrowhead" offers a unique hammered effect due to the shape of its facets. 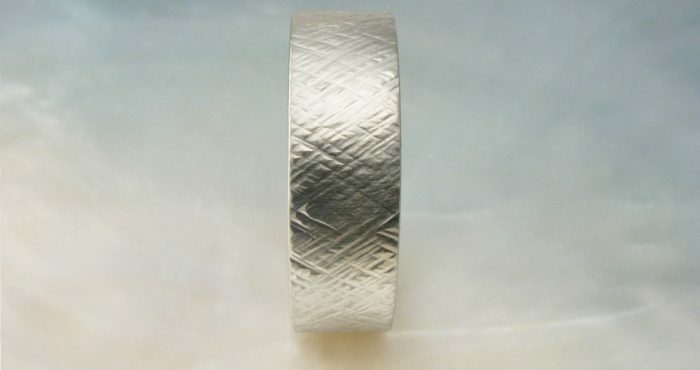 This style is available only for domed bands. 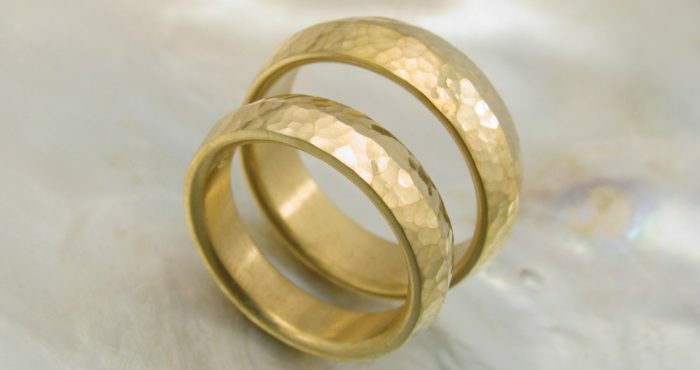 The cobblestone hammering style is what people typically think of when they envision hammered metal – a random scattering of light. 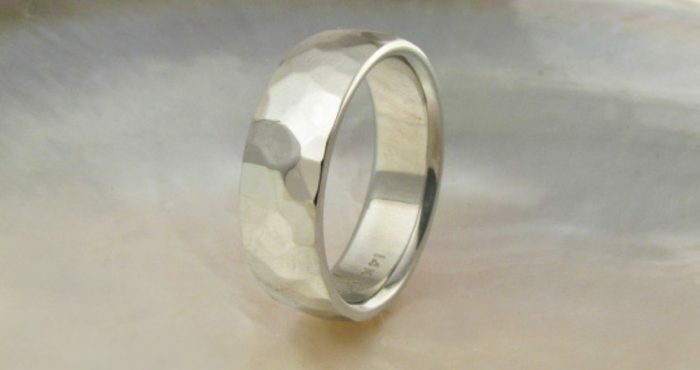 Its facets are a medium size in comparison with those of some of our other hammering styles and somewhat angular in form. 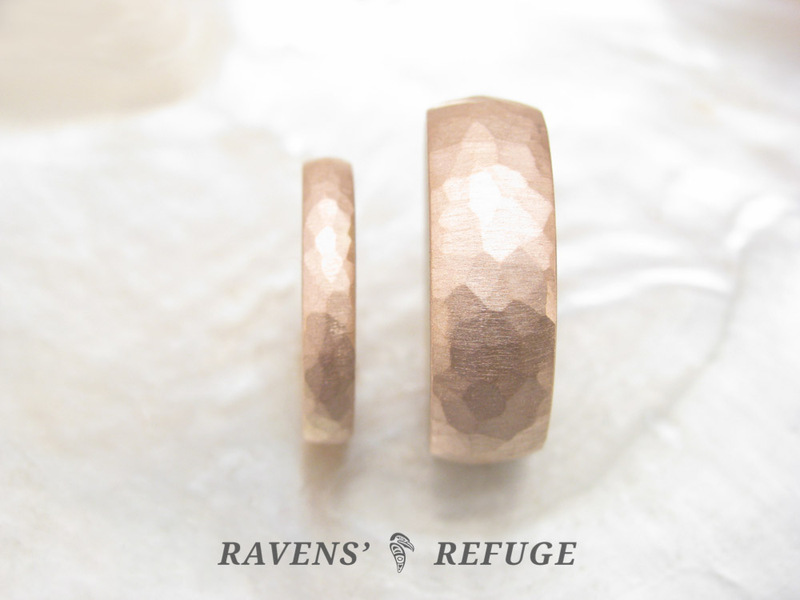 The cobblestone style works well with both domed and flat bands. 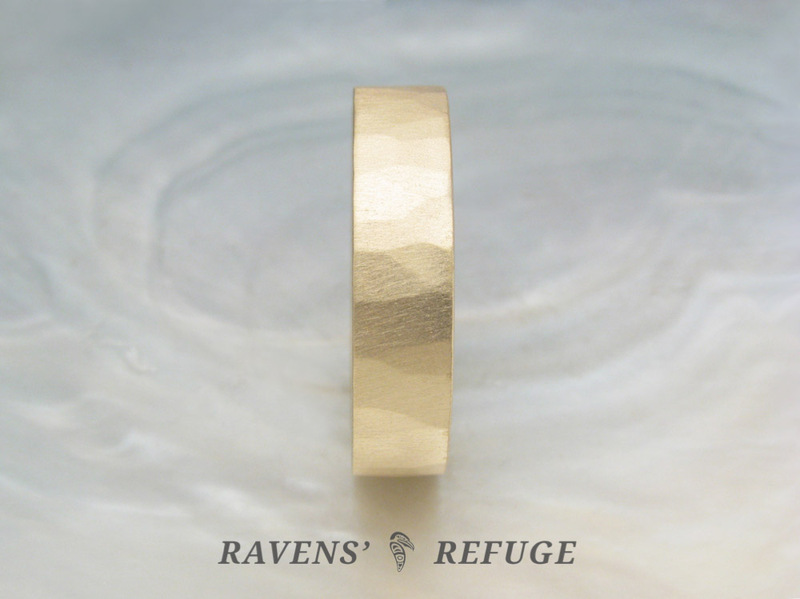 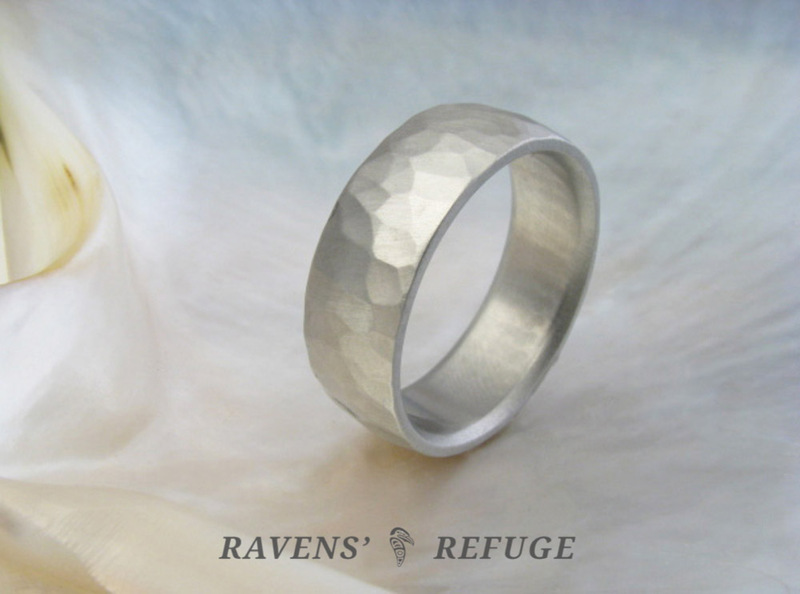 Our faceted bands are textured by means of hand filing rather than hammering. 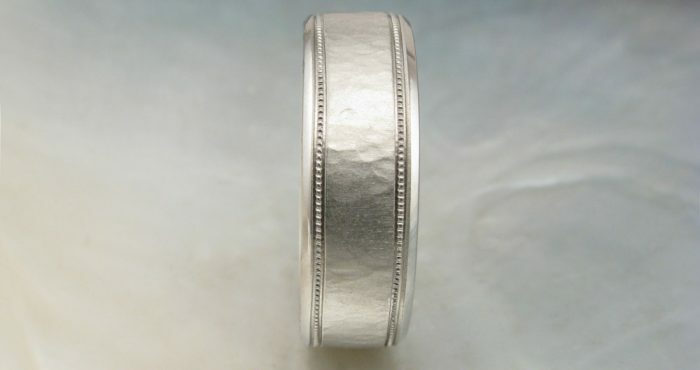 In the examples shown, a controlled manner of filing was used for the smaller band, while a random filing was employed on the larger bands. 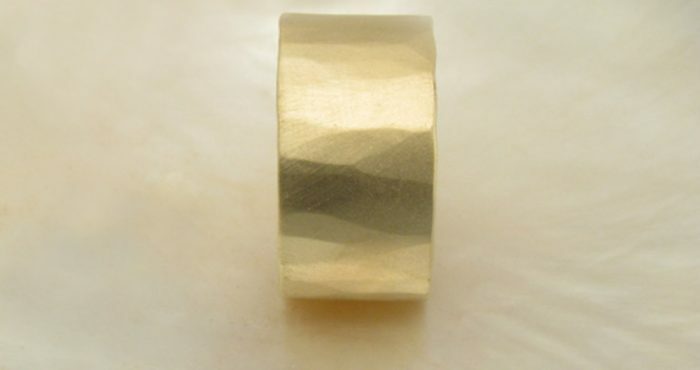 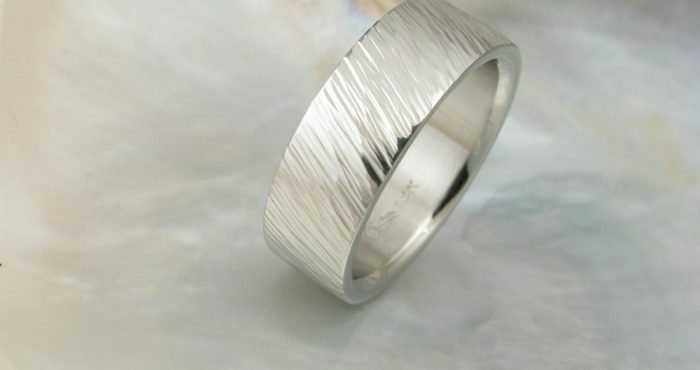 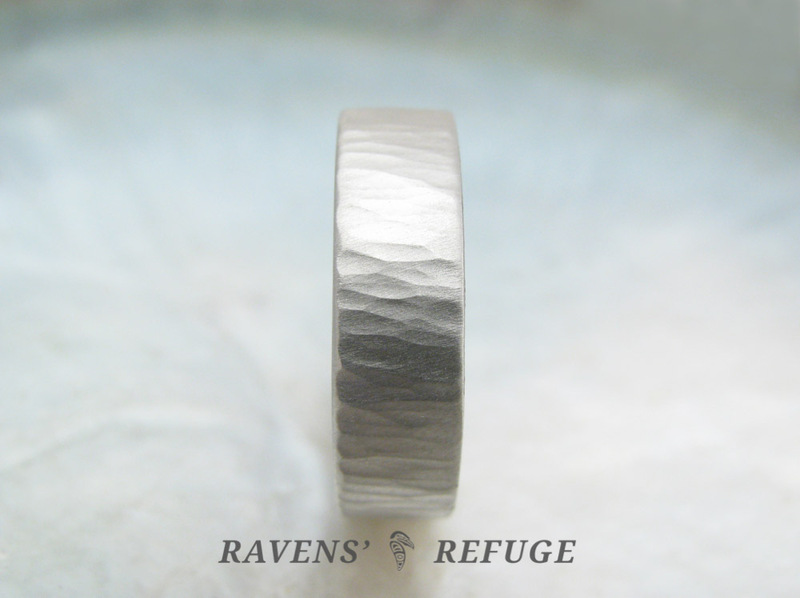 The random filing can be utilized to create a warped effect, whereby the light shifts across the band, never settling. 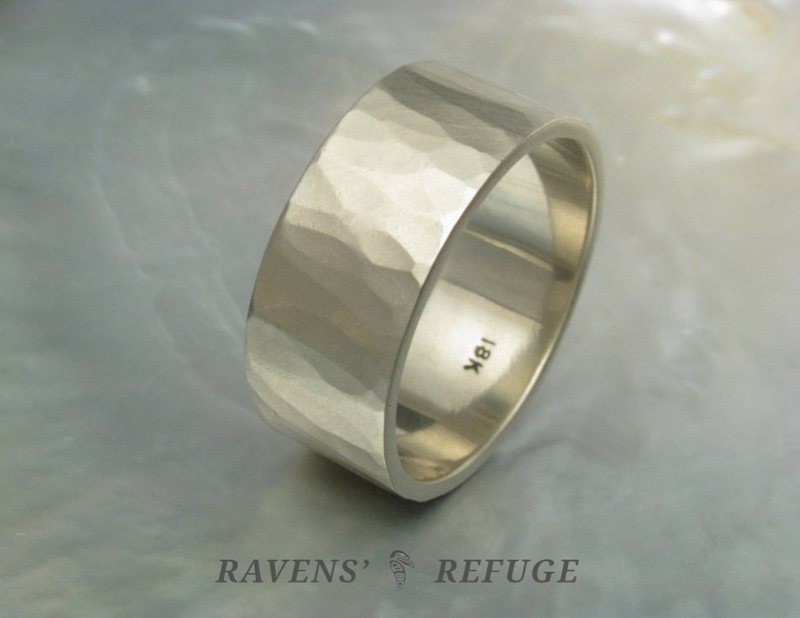 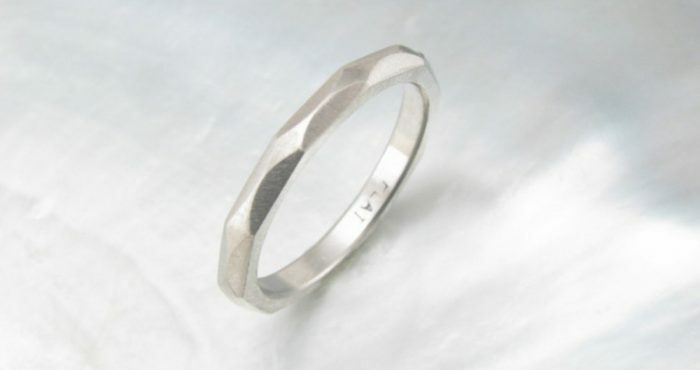 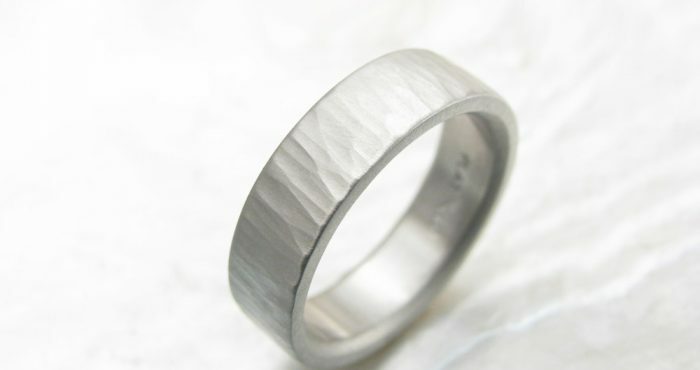 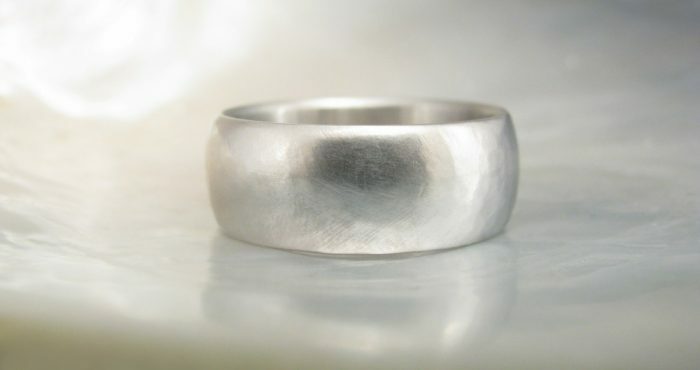 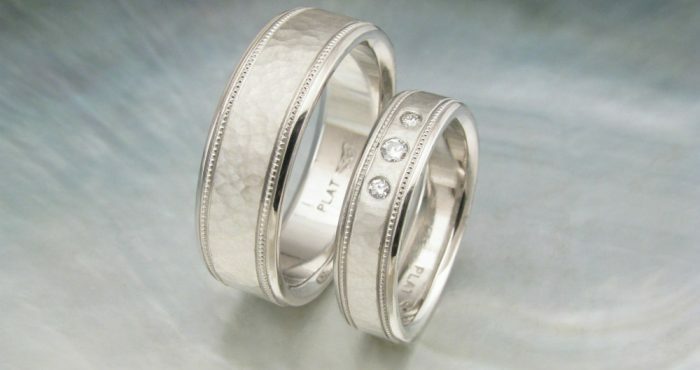 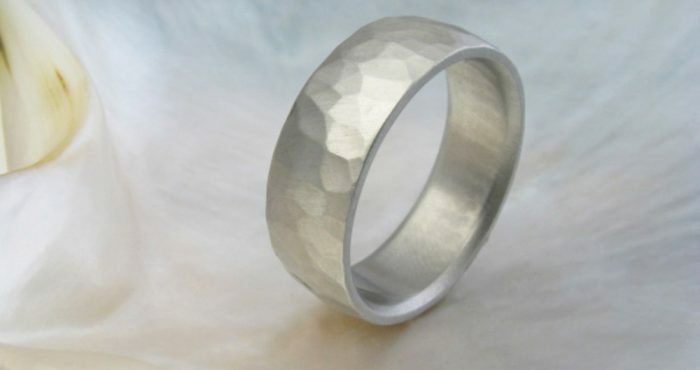 The “forged” style is hammered only in the sense that the hammer is used to shape the band into its present form. 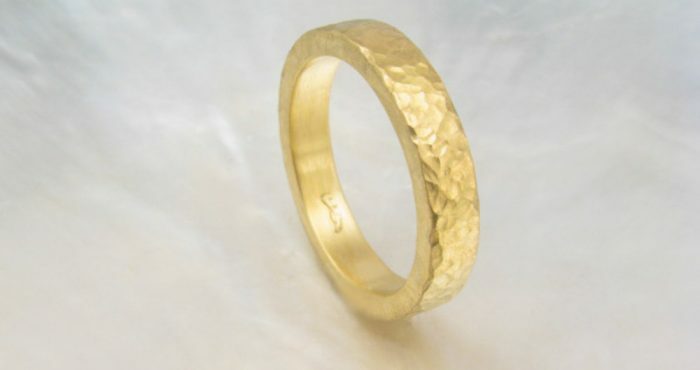 The effect is a natural and organic aesthetic. 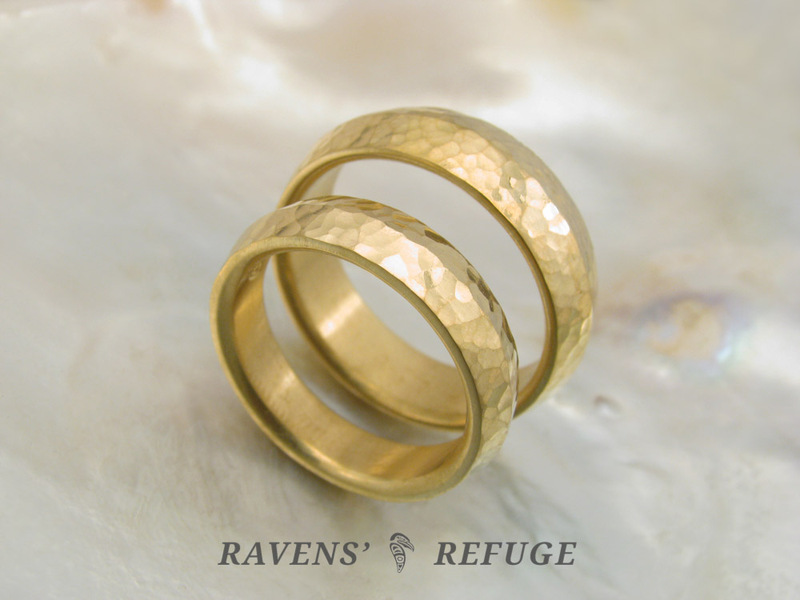 These facets are quite large, and they lend subtle drama and quiet strength to wider bands. 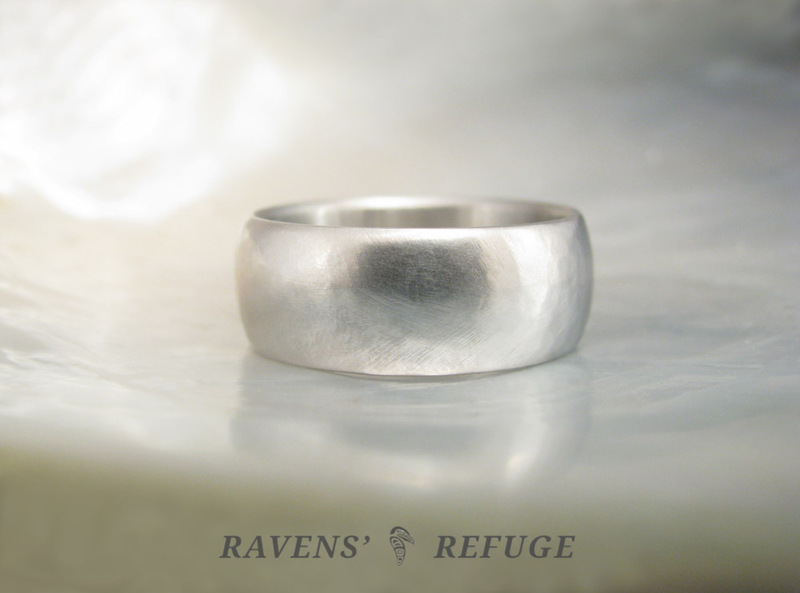 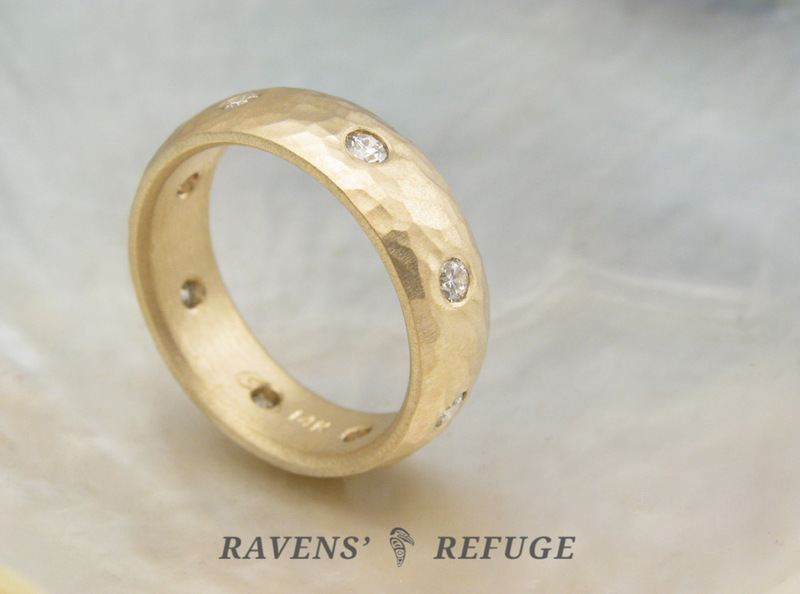 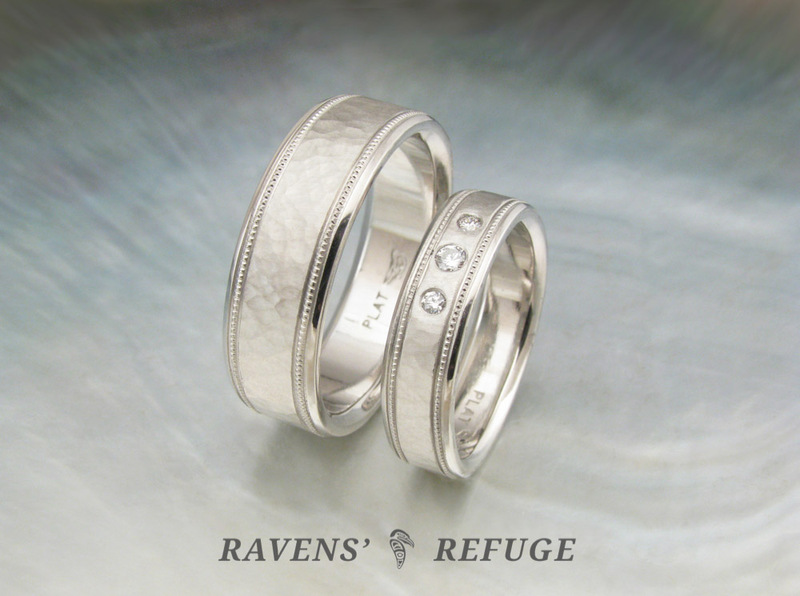 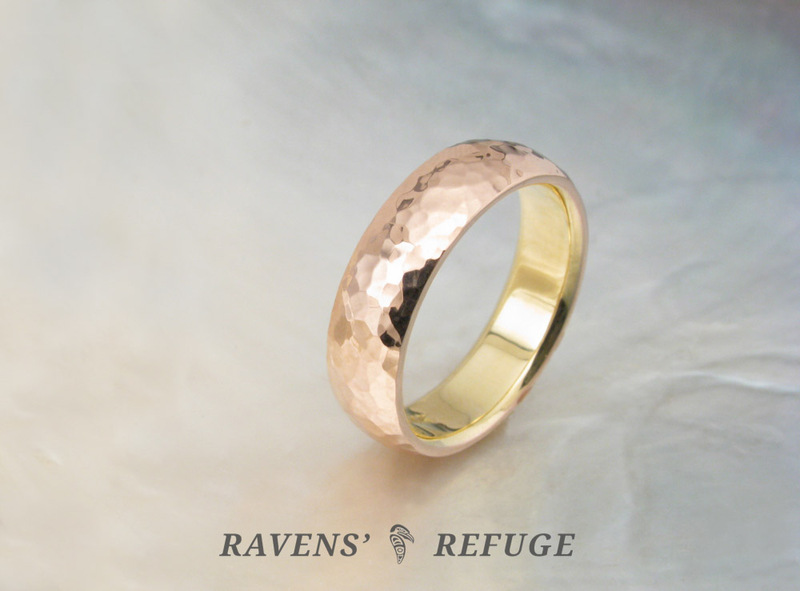 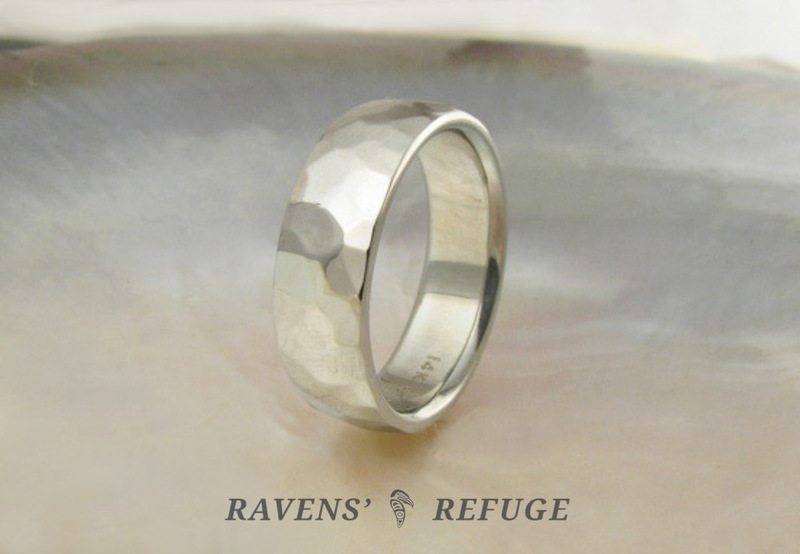 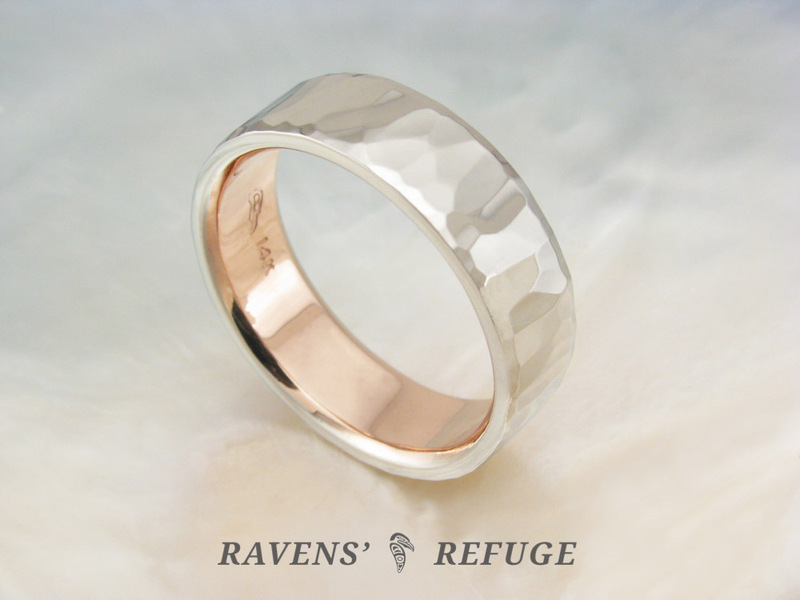 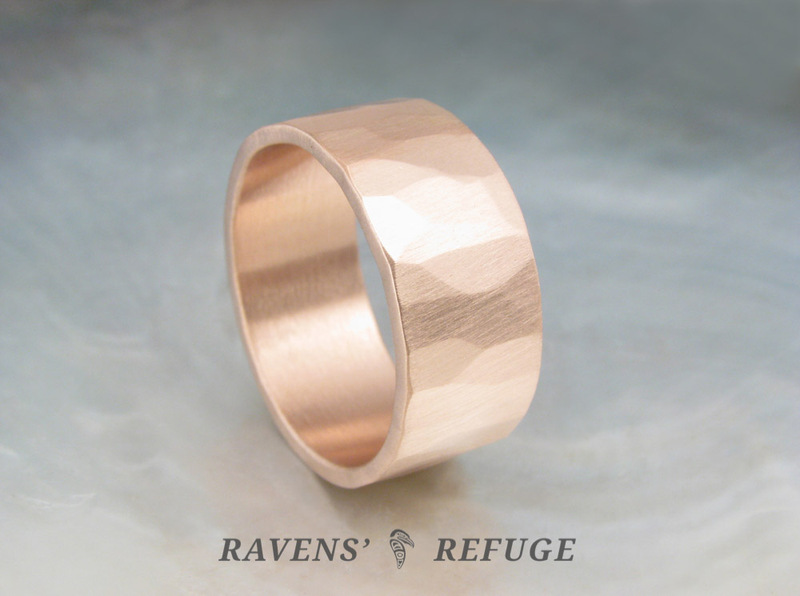 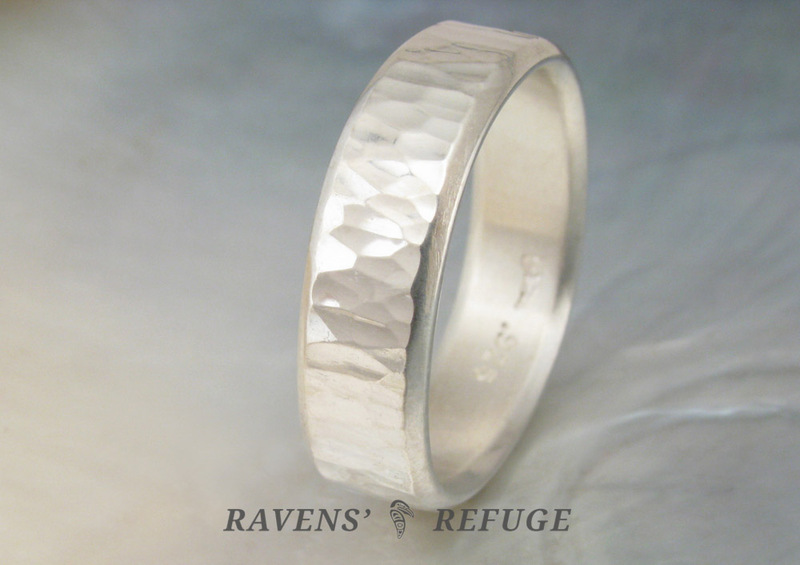 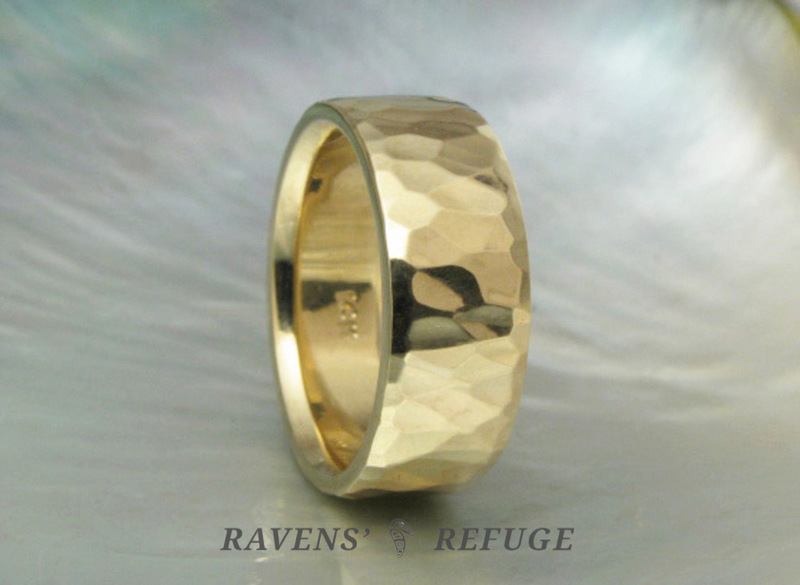 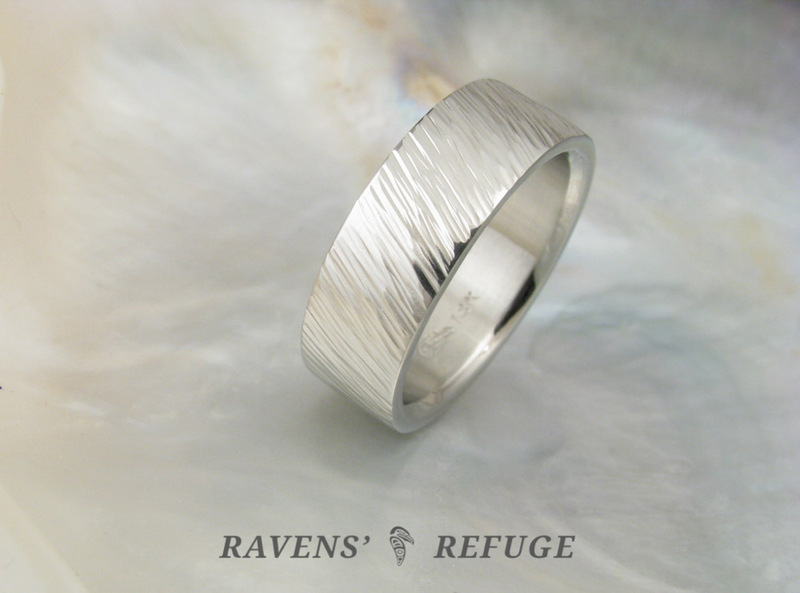 On narrower bands, the “forged” facets offer a rustic effect. 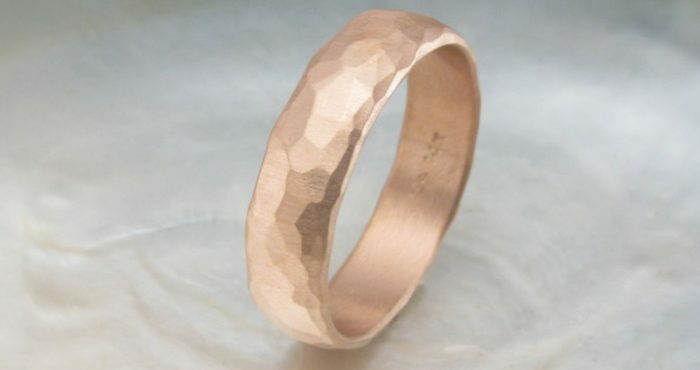 Reminiscent of large slabs of granite, this hammering style has angular facets that are among the largest of those found in our hammered bands. 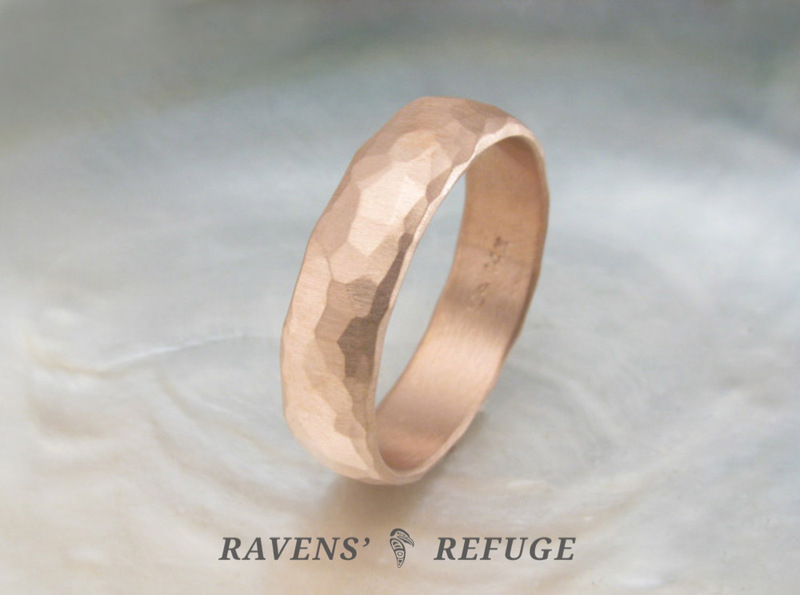 The aesthetic is rustic and natural. 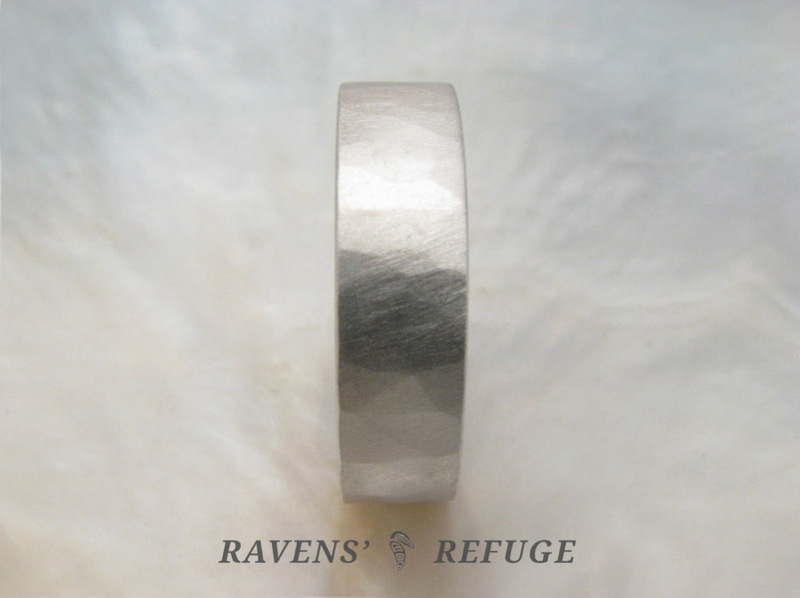 The granite style works well with both domed and flat bands, though the facets will appear somewhat smaller on domed bands due to the arc of the band. 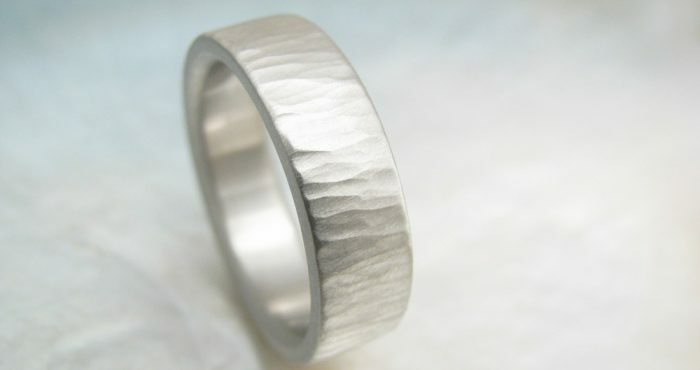 The honeycomb hammering style is more textured than most of our other hammering styles. 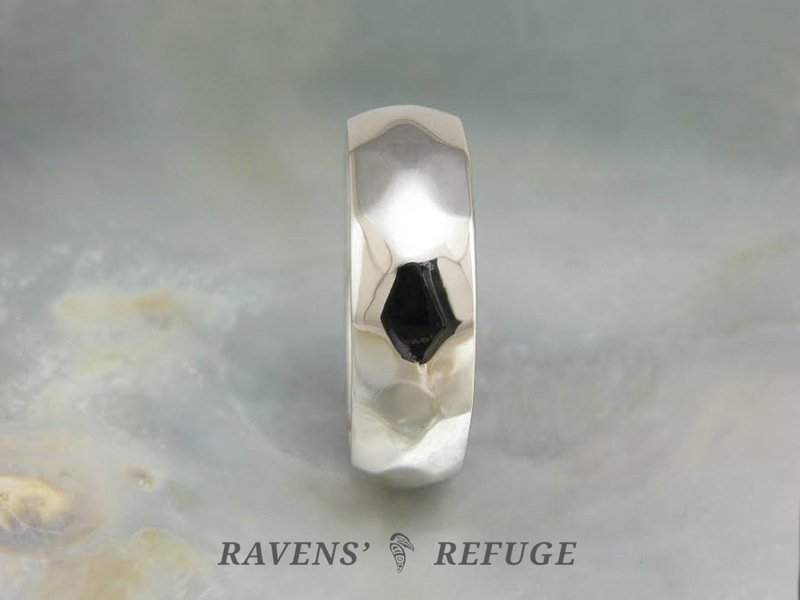 The facets, somewhat deep and angular in form, almost seem to drip with molten metal. 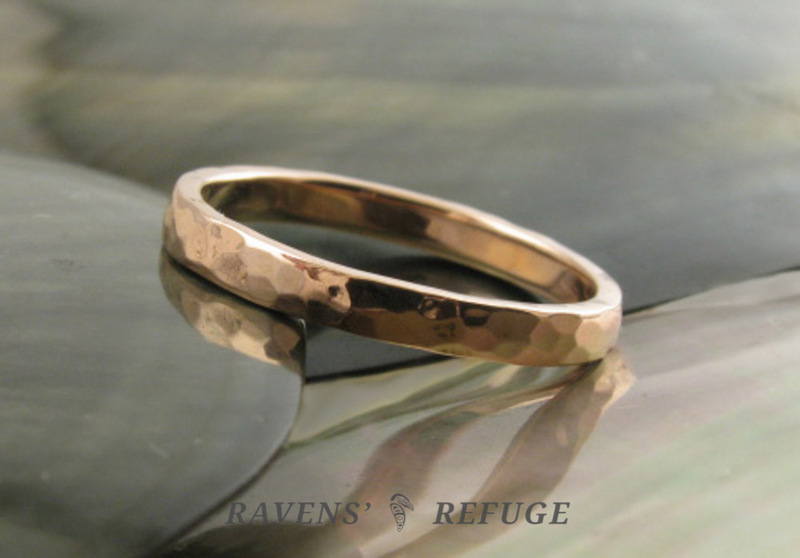 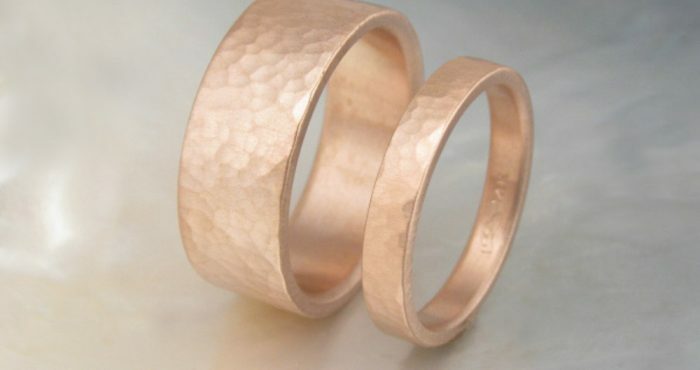 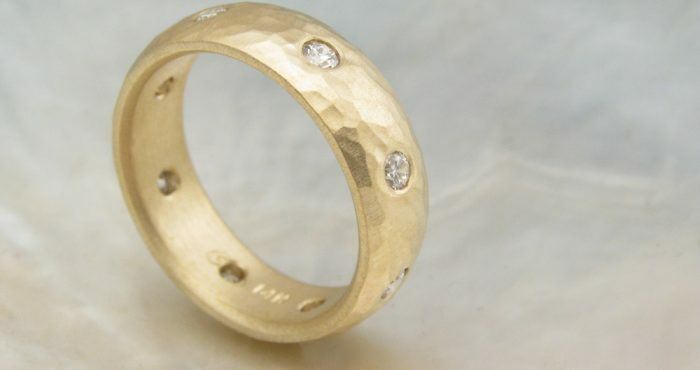 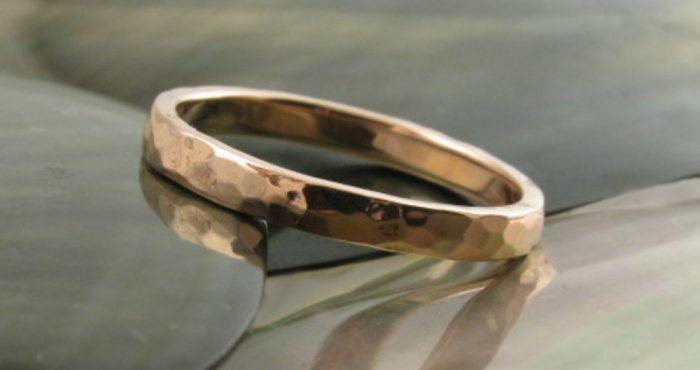 This style works best with softer metals such as rose gold and the higher karats of yellow gold. 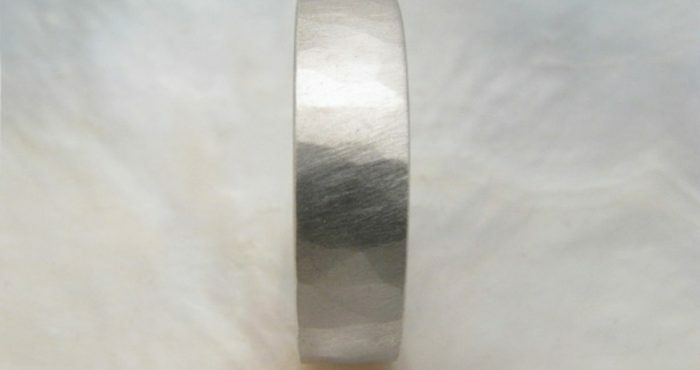 It also looks great on platinum, though not quite as "drippy." 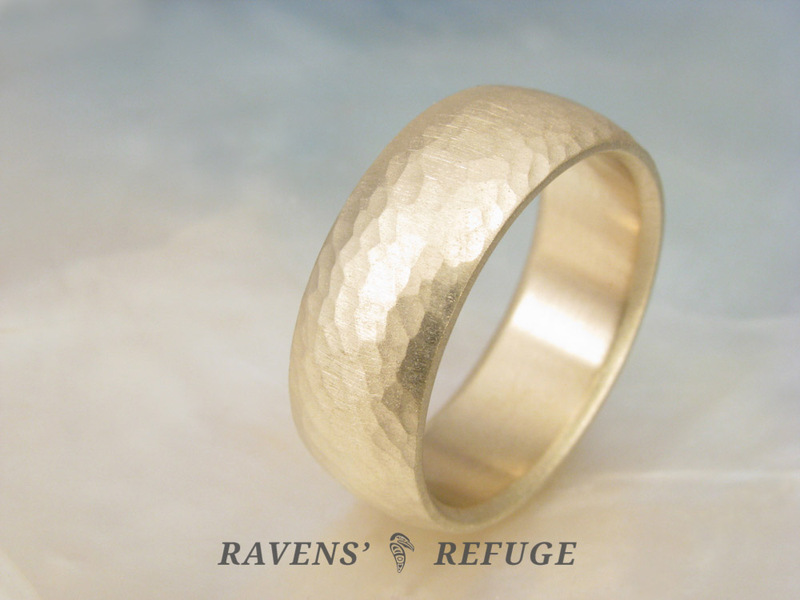 The leaf hammering style is our most textured hammering style at this time, with hundreds of tiny *pings* of the hammer. 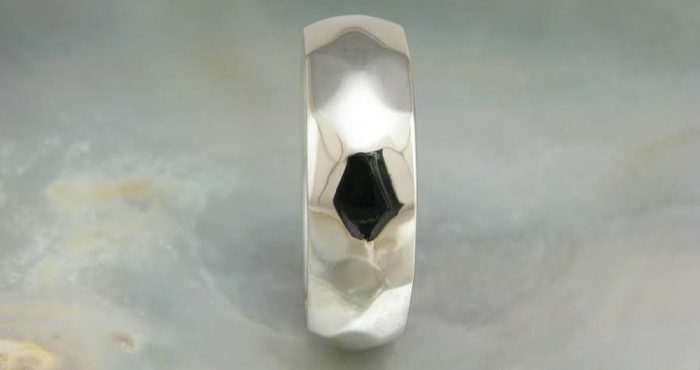 Its facets are small and round. 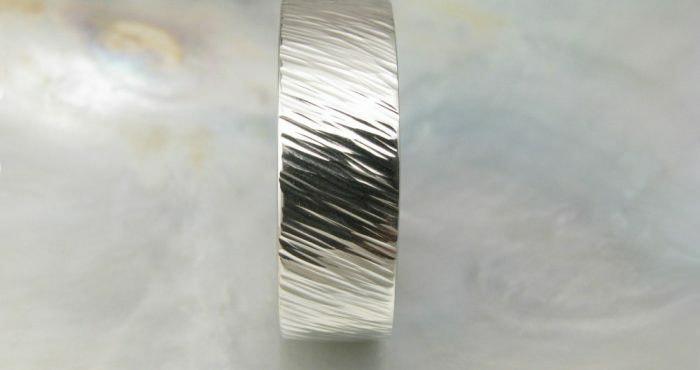 This style works well with both domed and flat bands, and is an excellent texture for a person who works extensively with his or her hands. 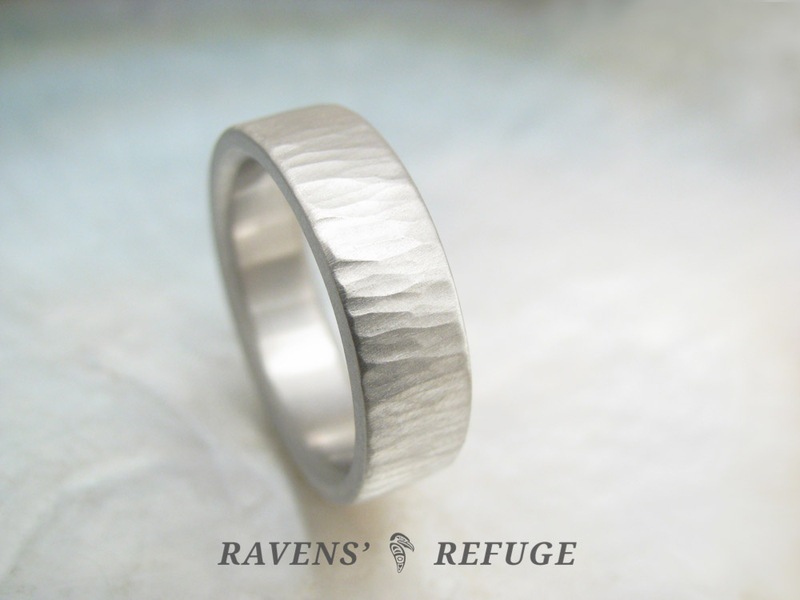 We recommend a satin finish for the leaf style. 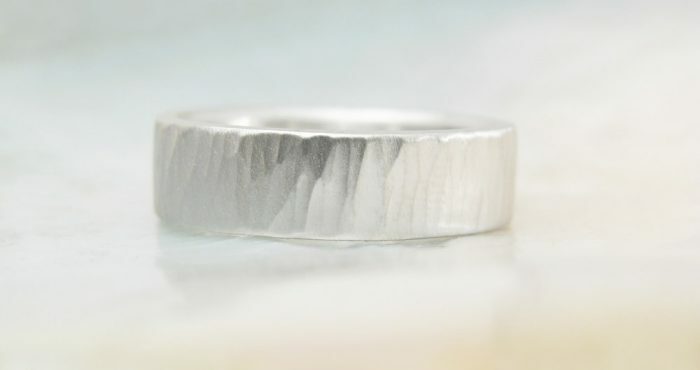 The pebble hammering style is created with small, rounded hammer strokes, resulting in a more textured finish than many of our other styles. 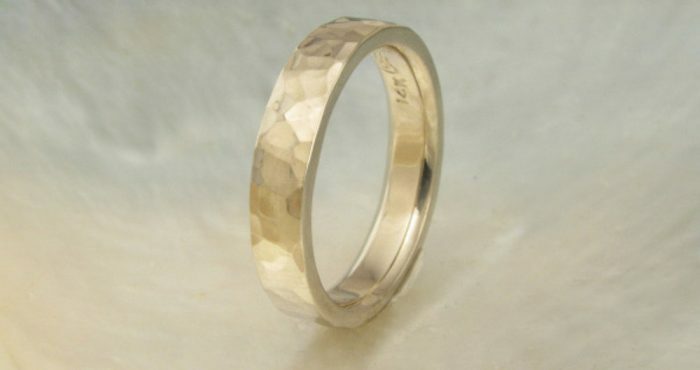 Its facets are smaller and less angular than those of cobblestone or arrowhead; and larger than those of leaf. 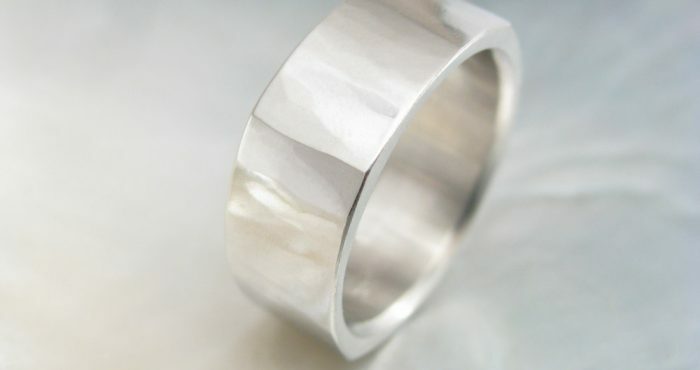 This hammering style lends itself well to both domed and flat bands. 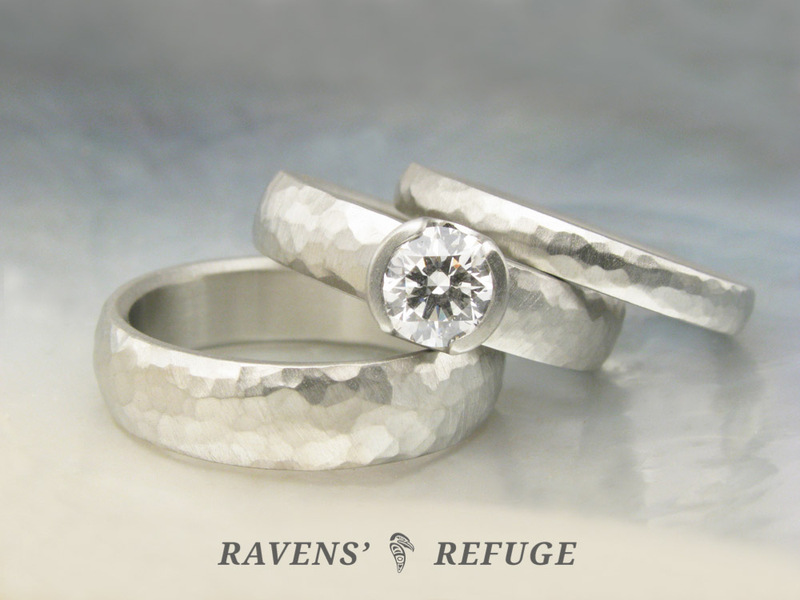 Here in Portland, we love rain & its gentle droplets. 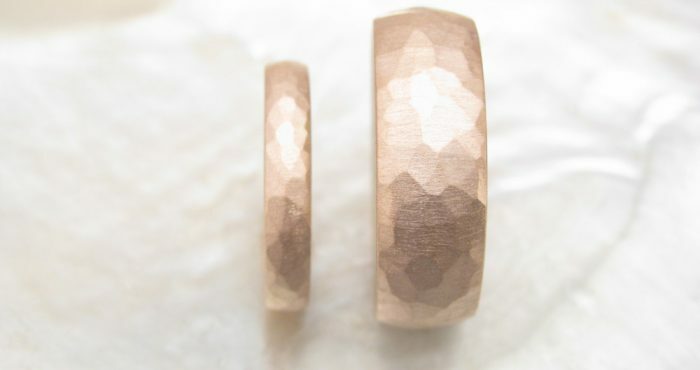 This hammer creates angular facets that are smaller than pebble, but larger than leaf. 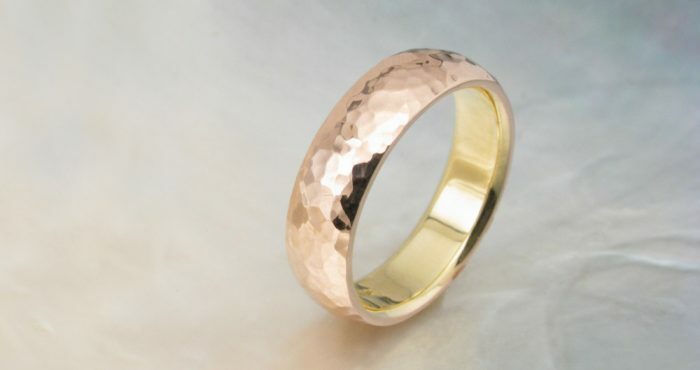 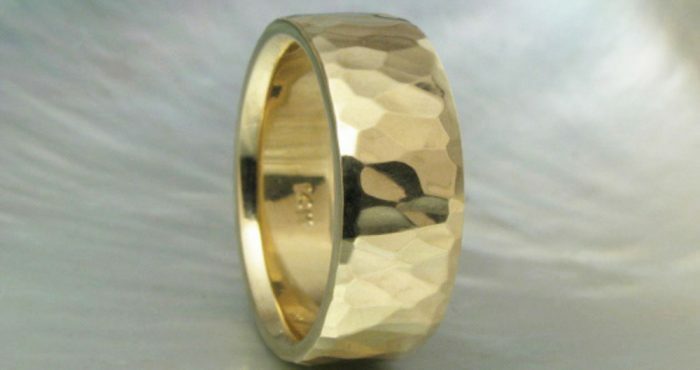 As with the honeycomb style, rain hammering yields a highly textured finish, especially on softer metals such as rose gold or higher karats of gold. 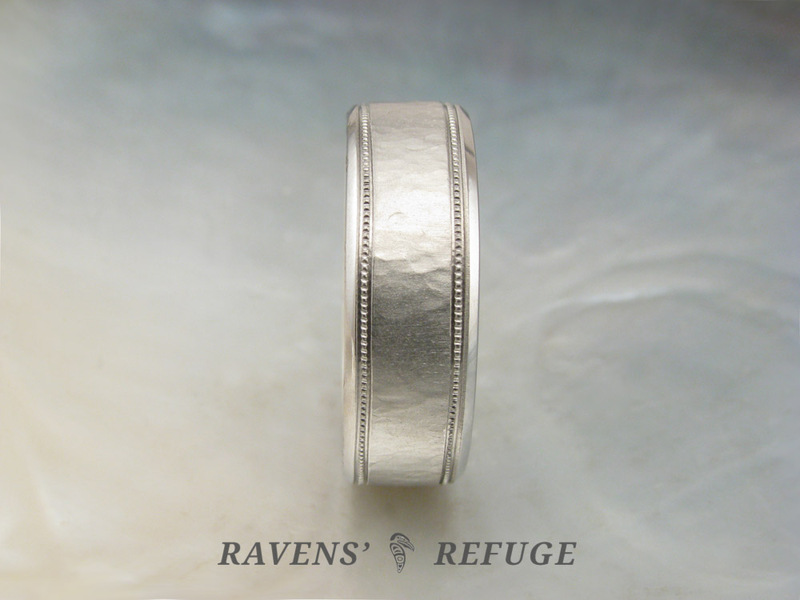 Rain works well on both flat and domed bands. 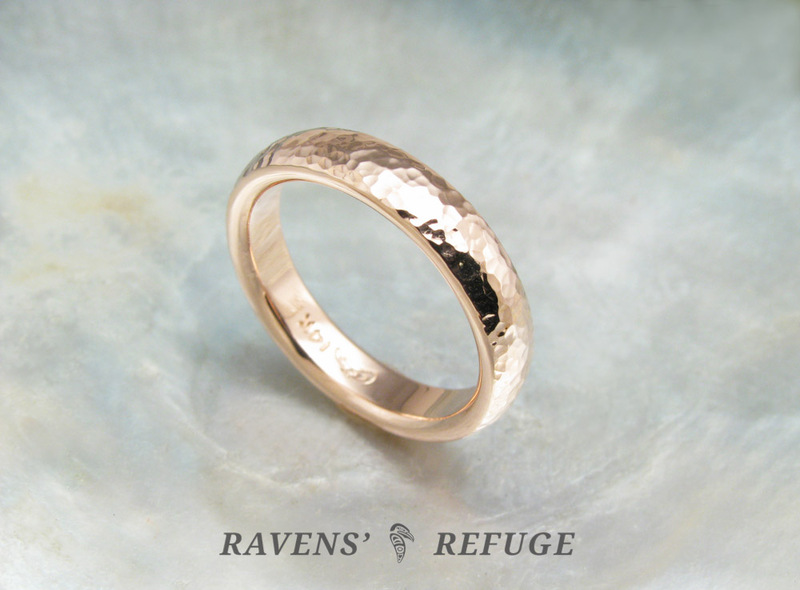 The straw style lends a textured Florentine effect to flat bands. 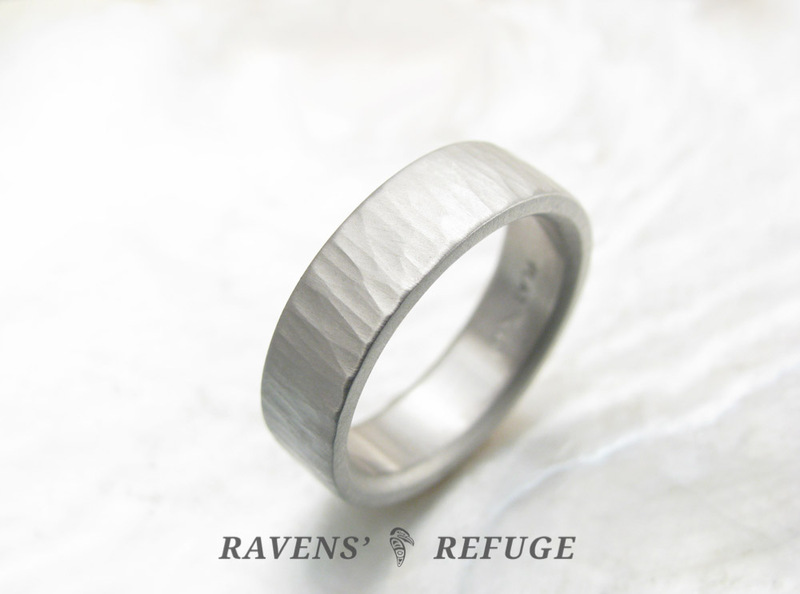 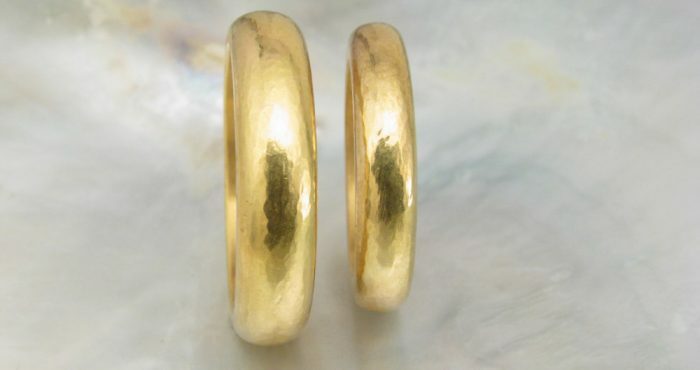 The hammer strokes criss-cross one another with long, slender impressions that are more definitive than the “Florentine finish” often given to wedding bands. 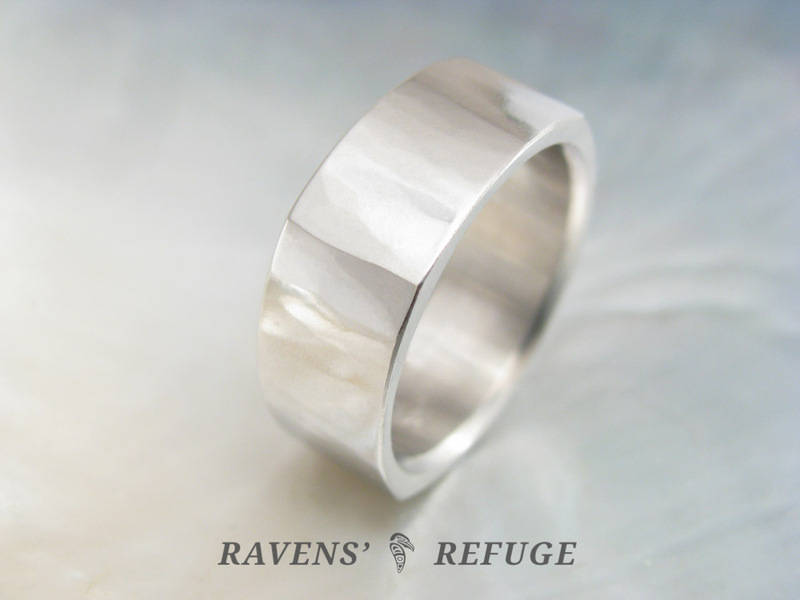 This style provides visual interest that is strong and elegant, while still natural in its handmade aesthetic. 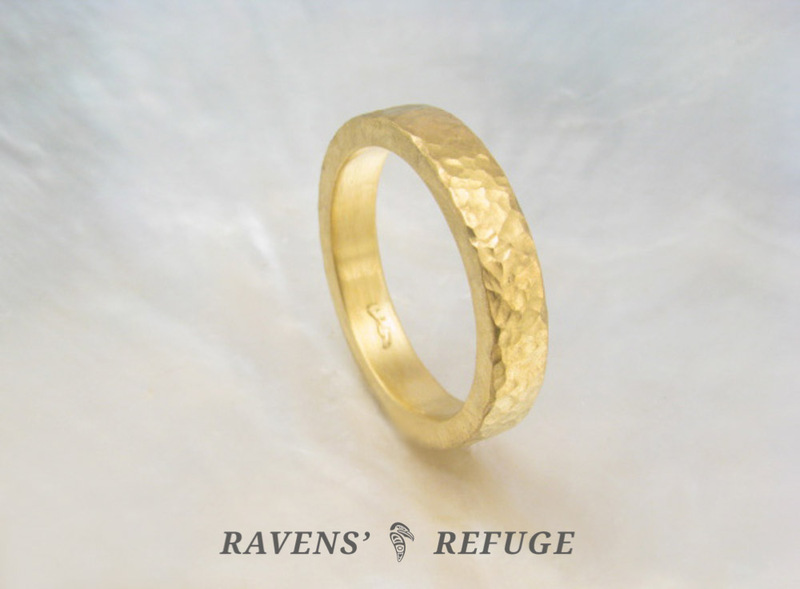 The tumbleweed style is created by hand-tooling a design in wax, and then casting the ring by means of the lost wax casting method. 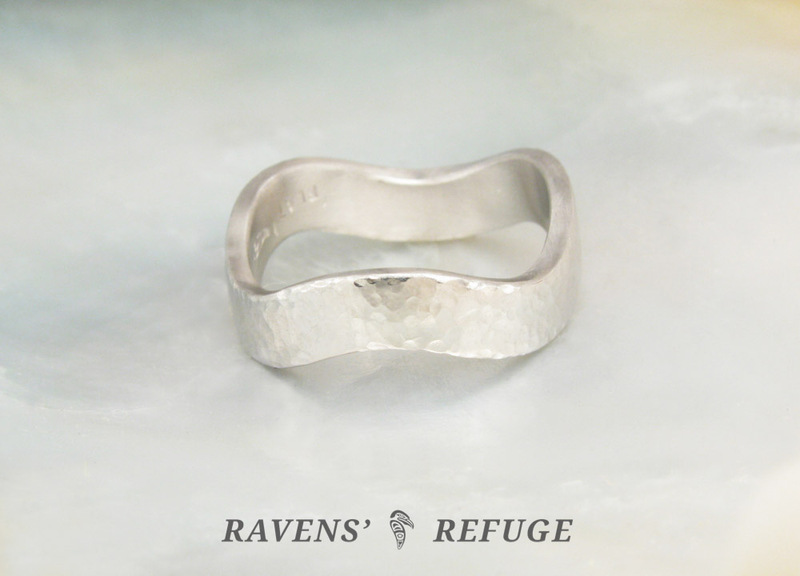 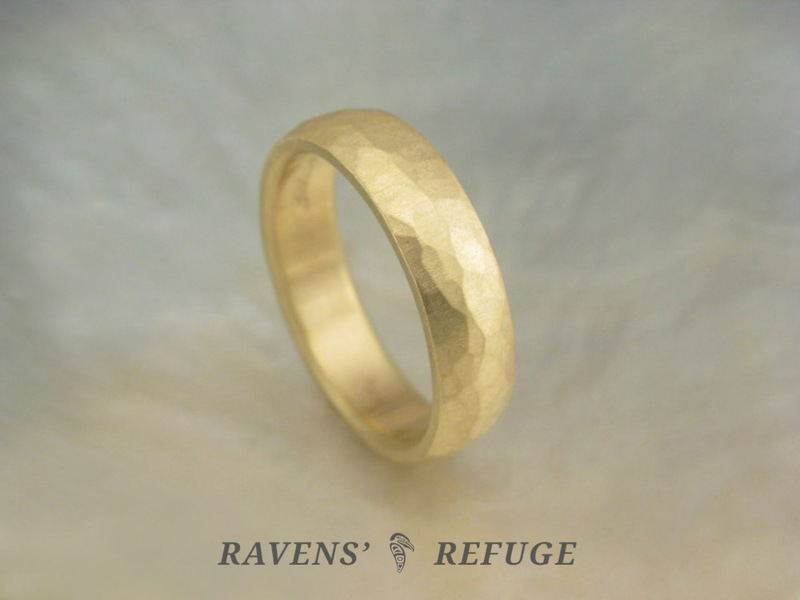 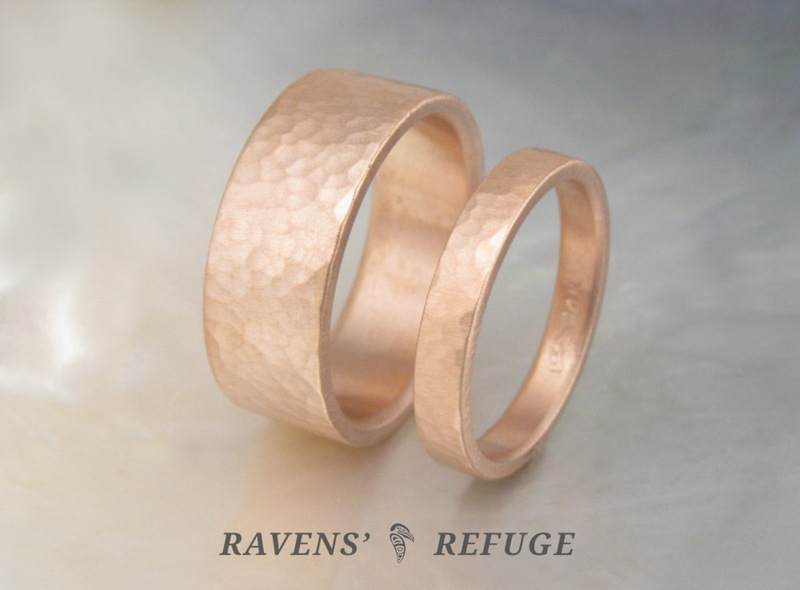 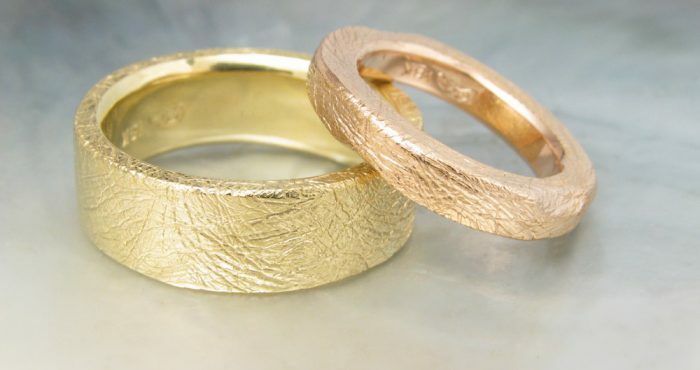 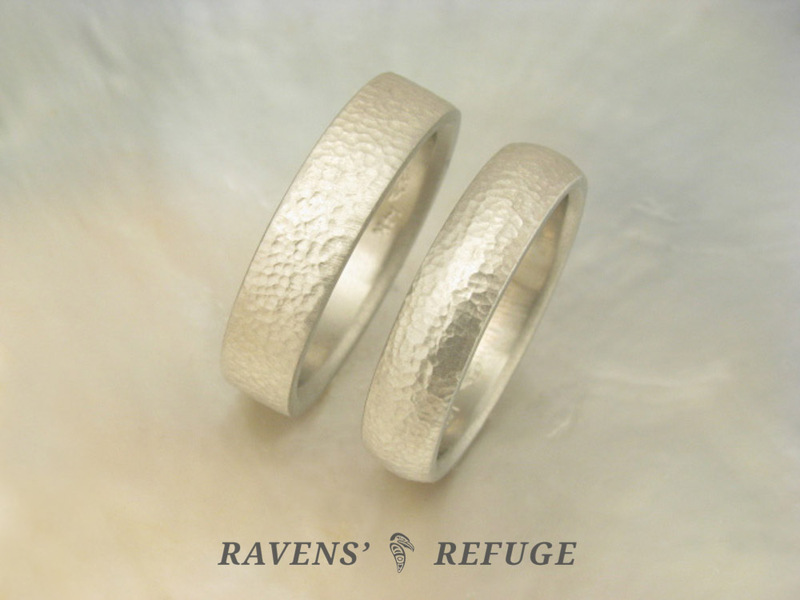 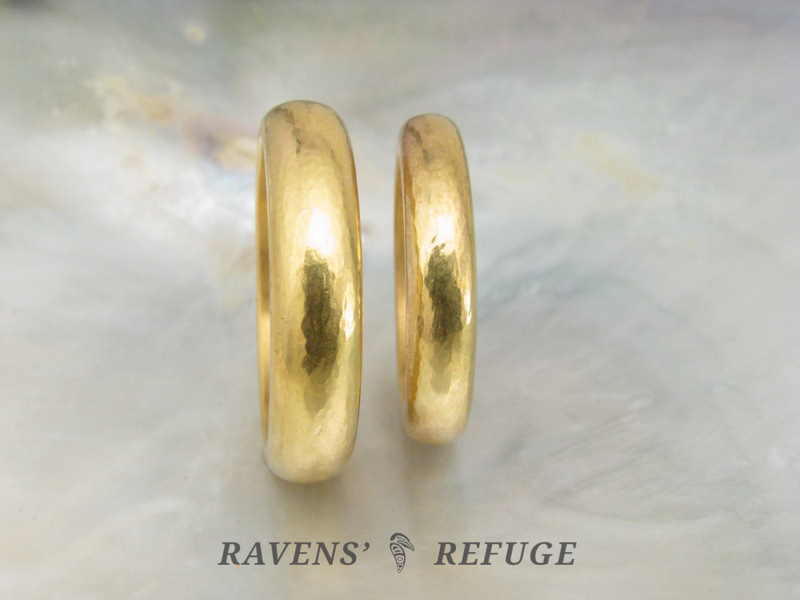 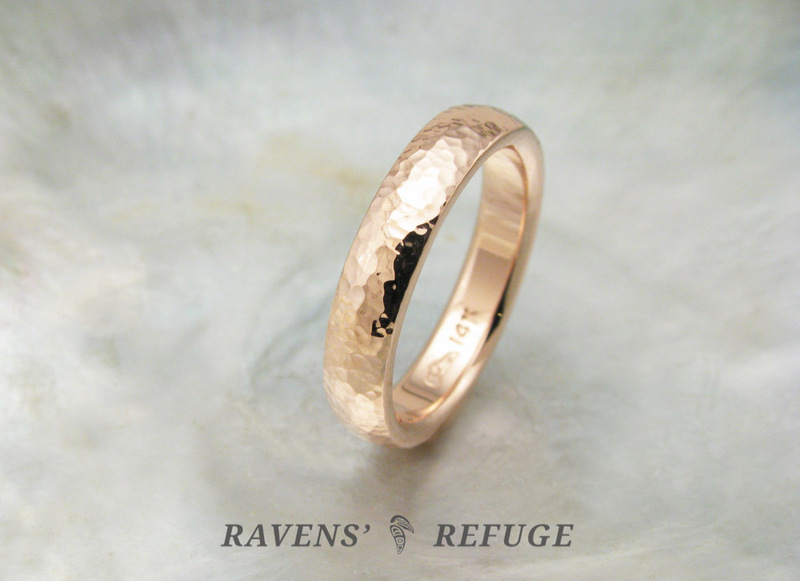 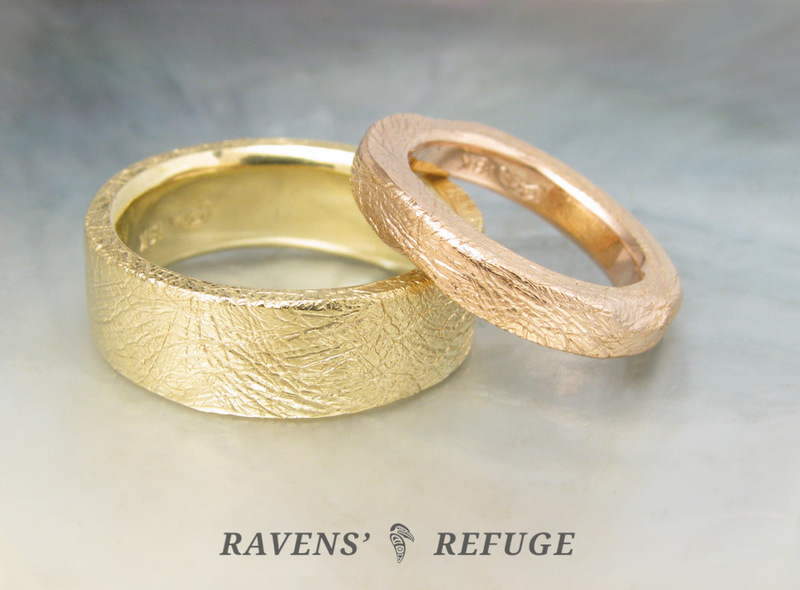 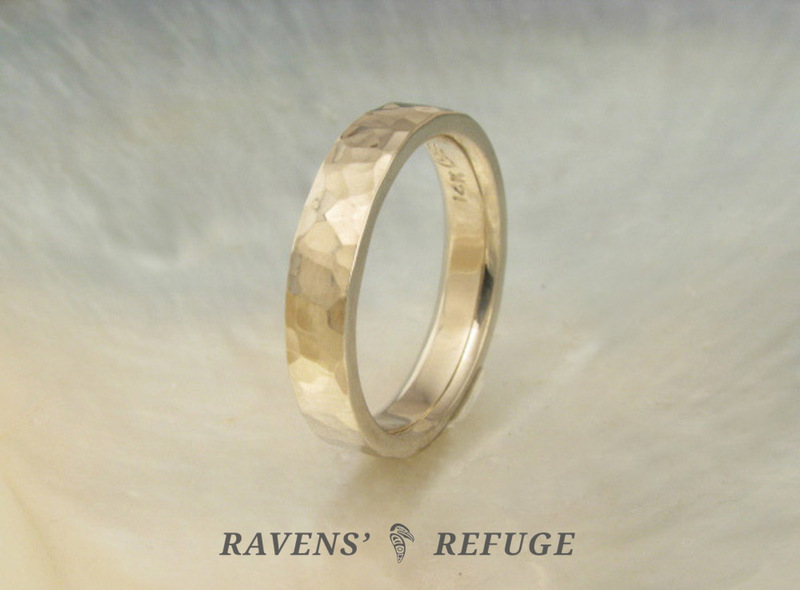 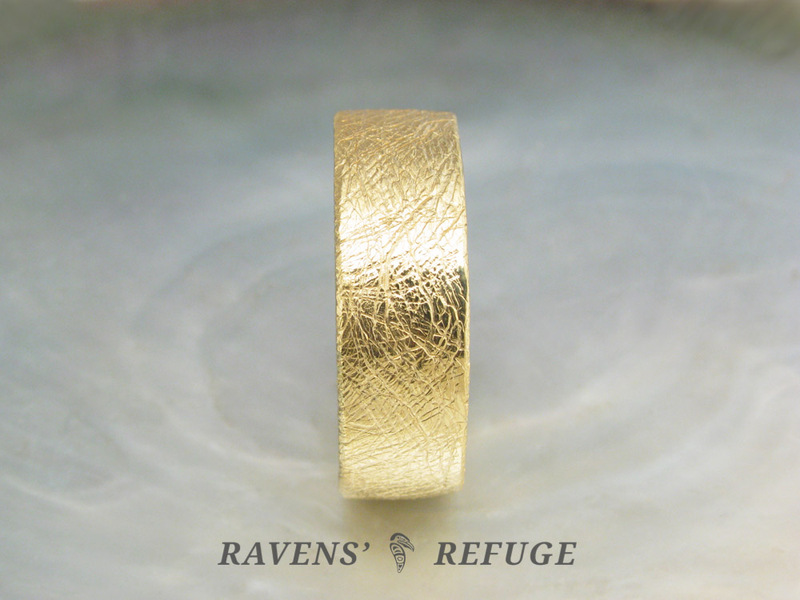 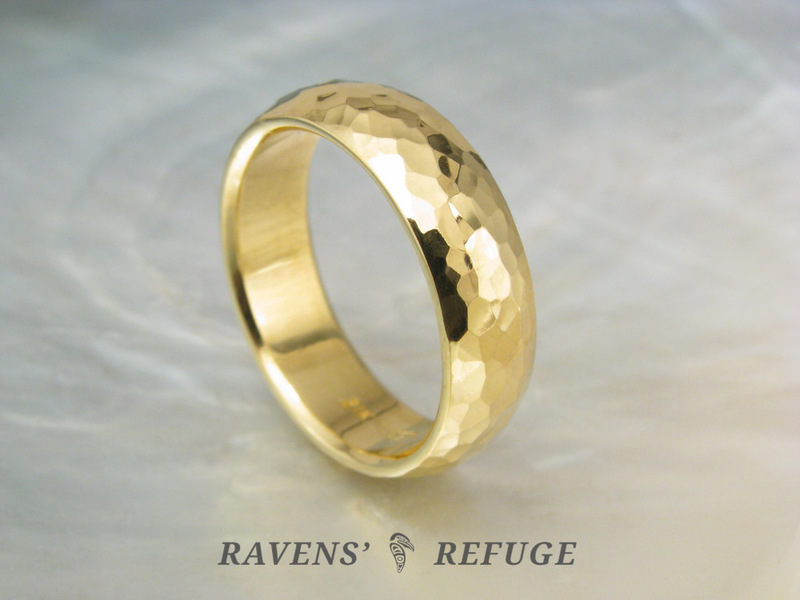 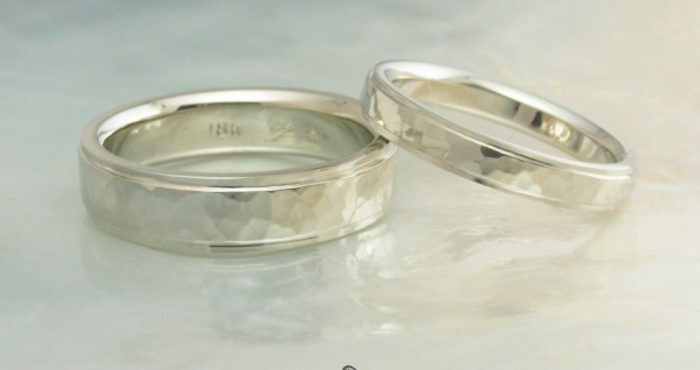 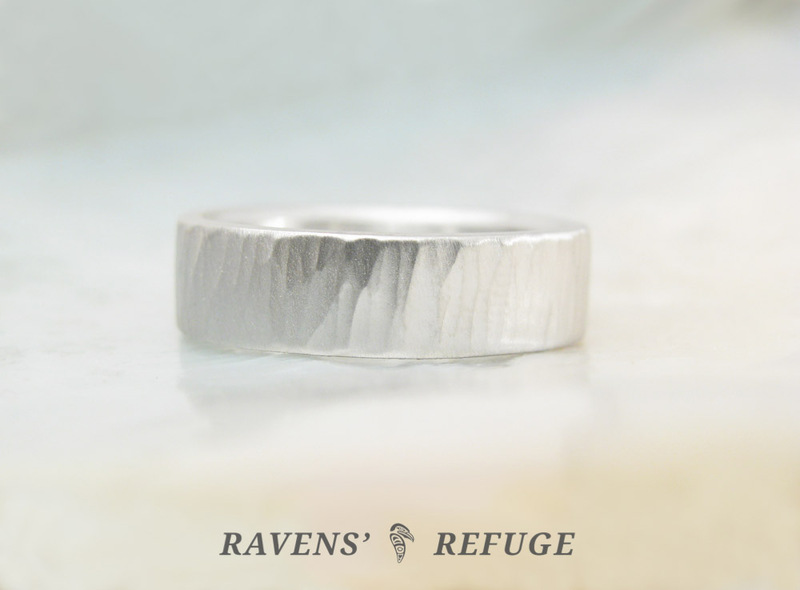 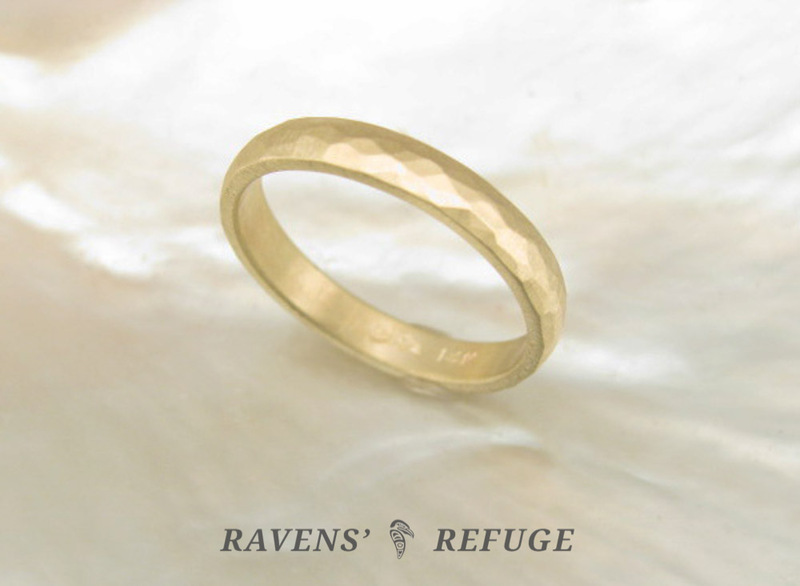 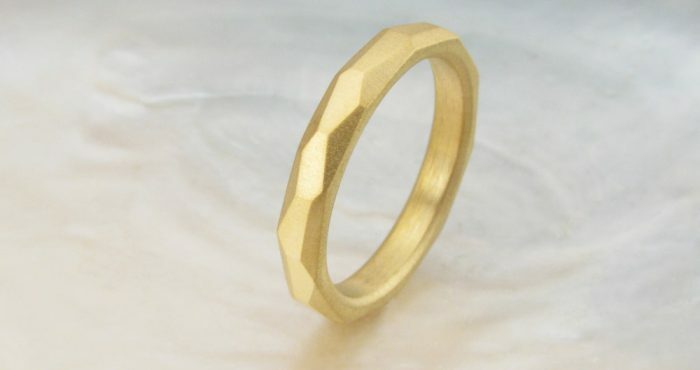 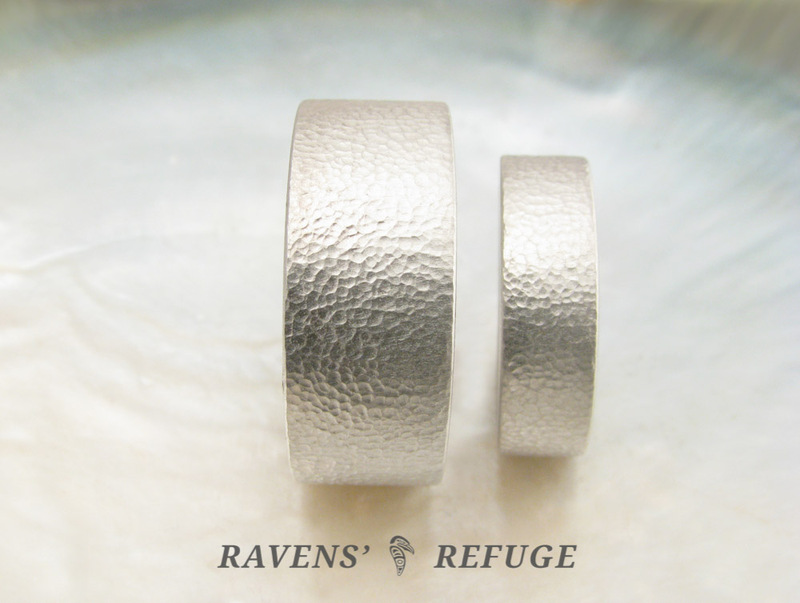 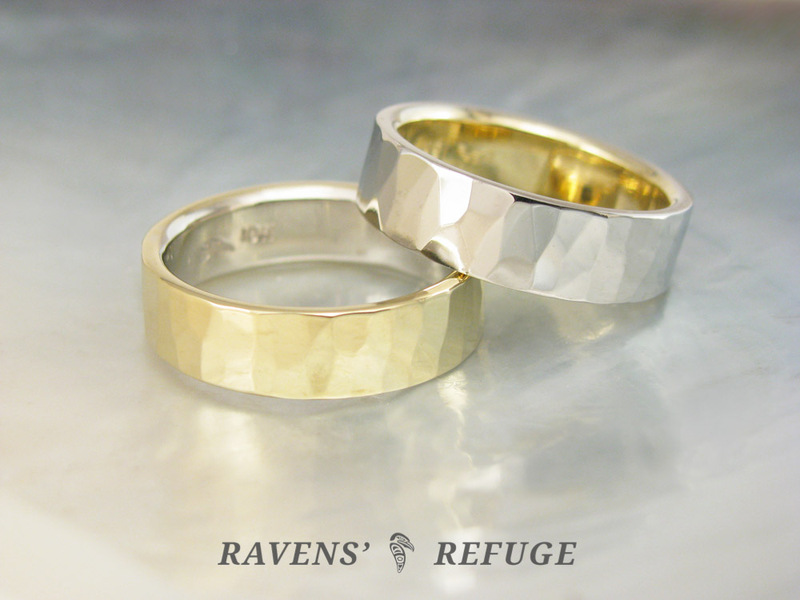 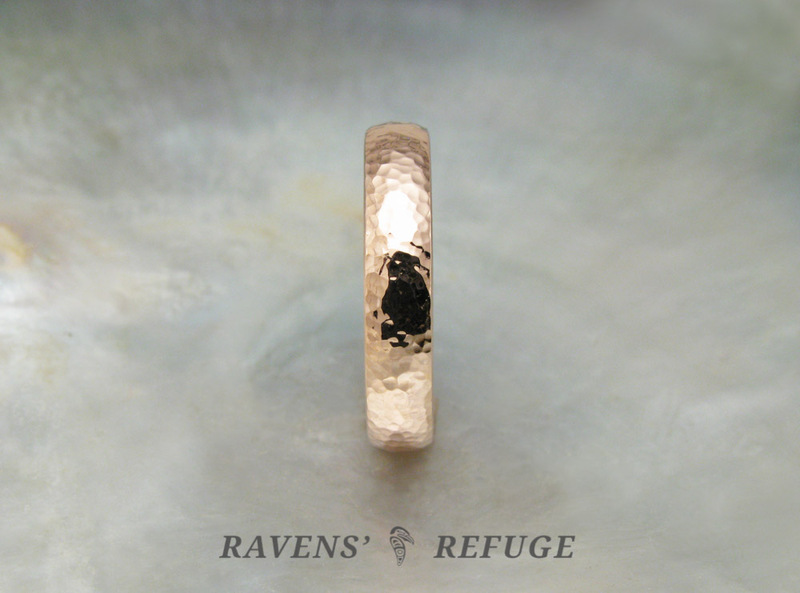 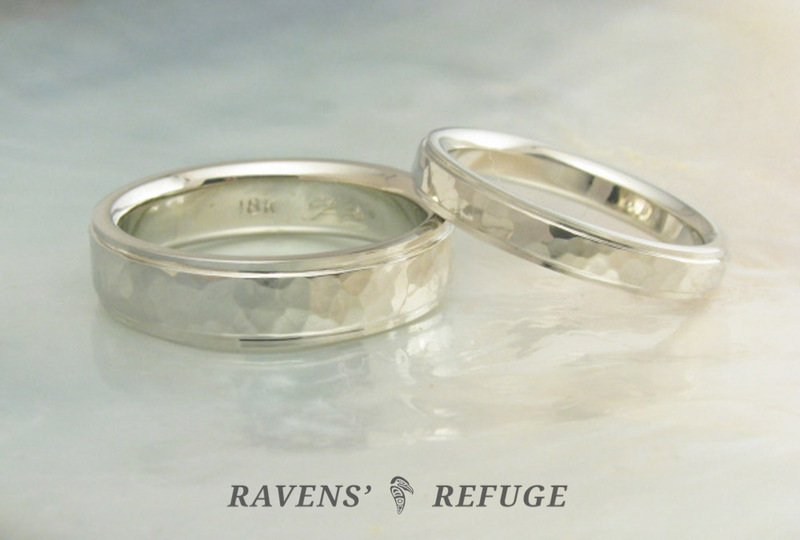 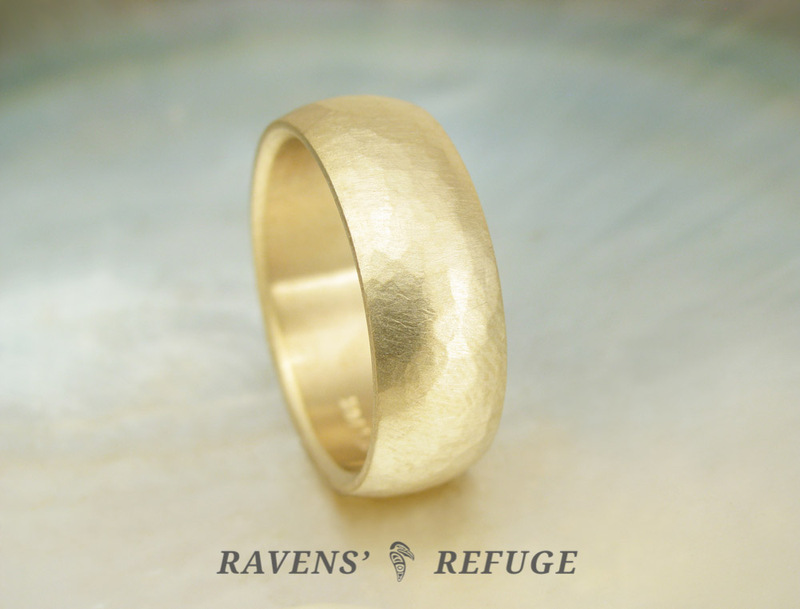 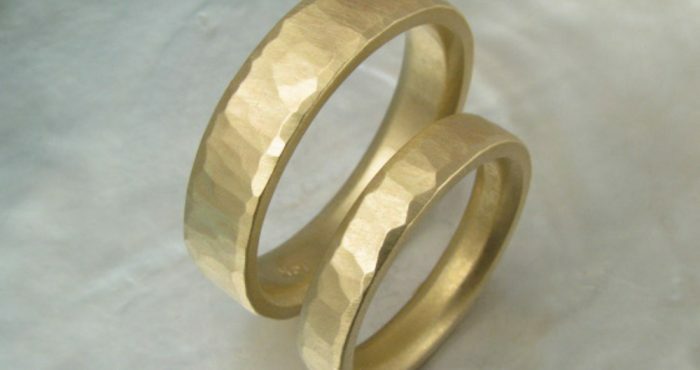 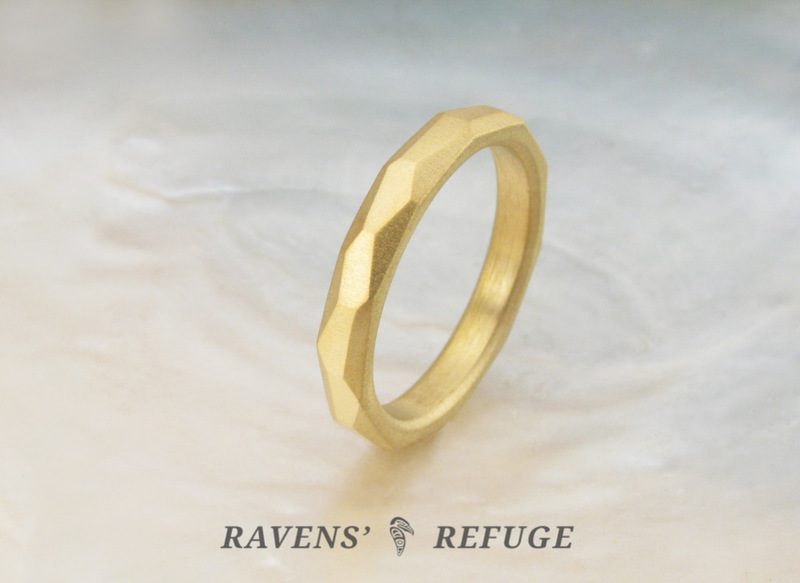 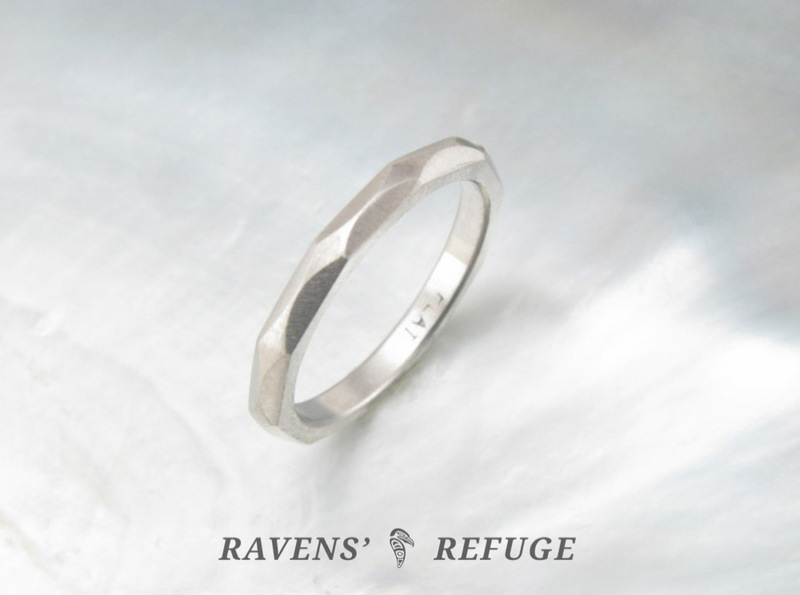 The design on each ring is highly individualized due to the nature of production. 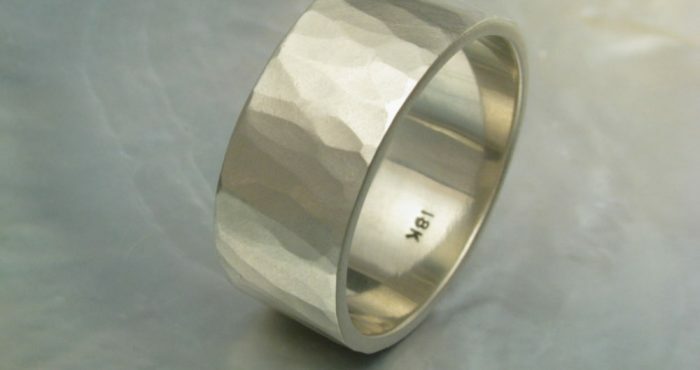 This design works equally well on flat bands and domed bands; and on conventional and unconventional profiles. 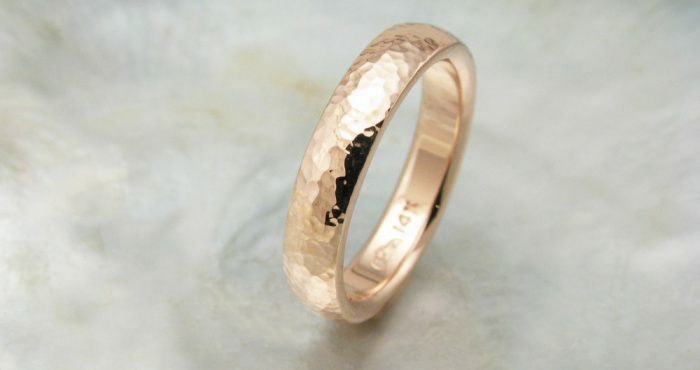 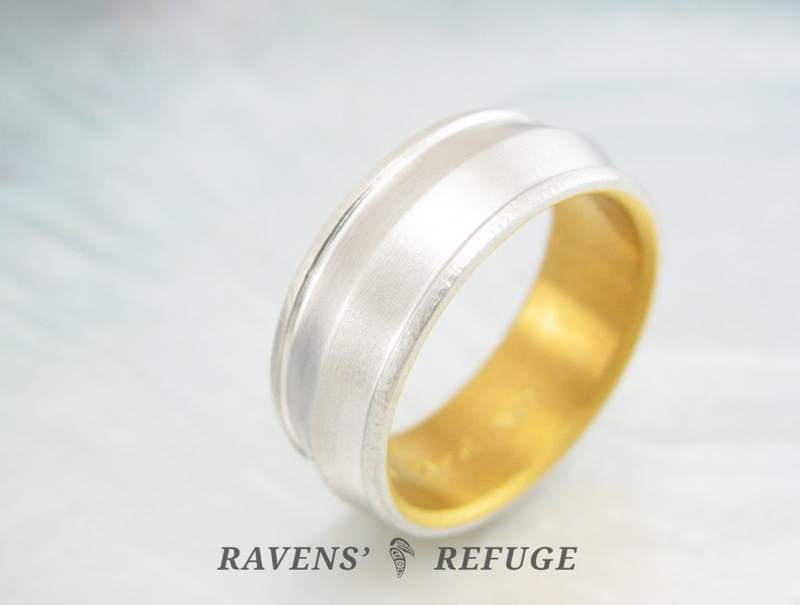 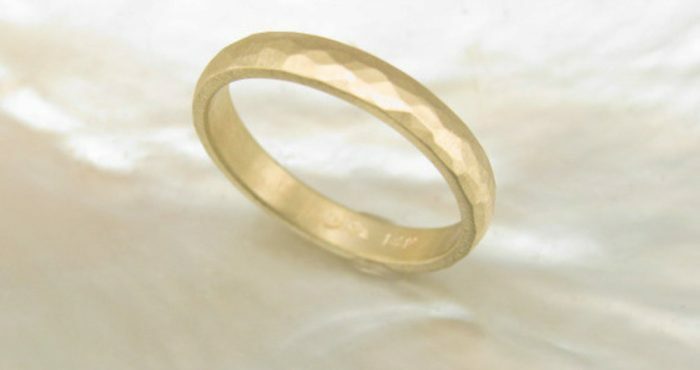 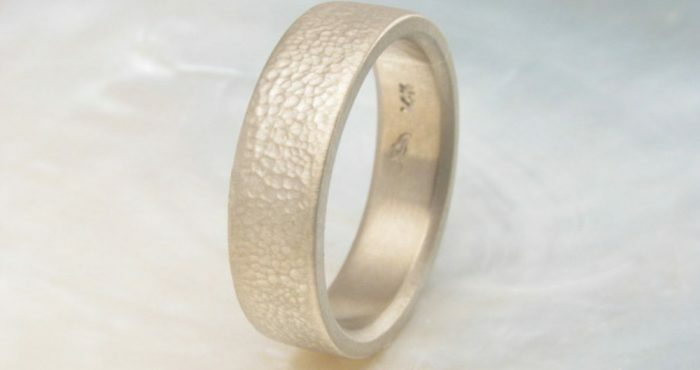 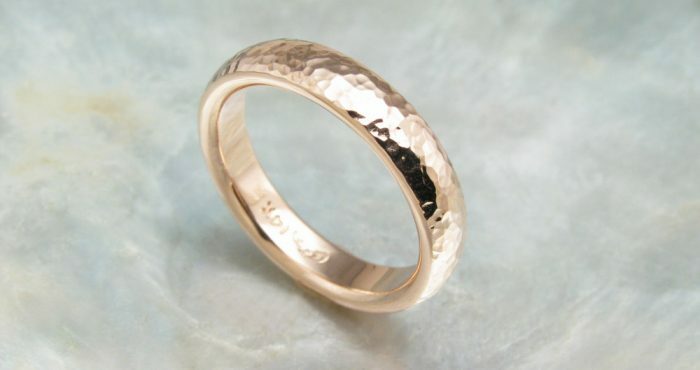 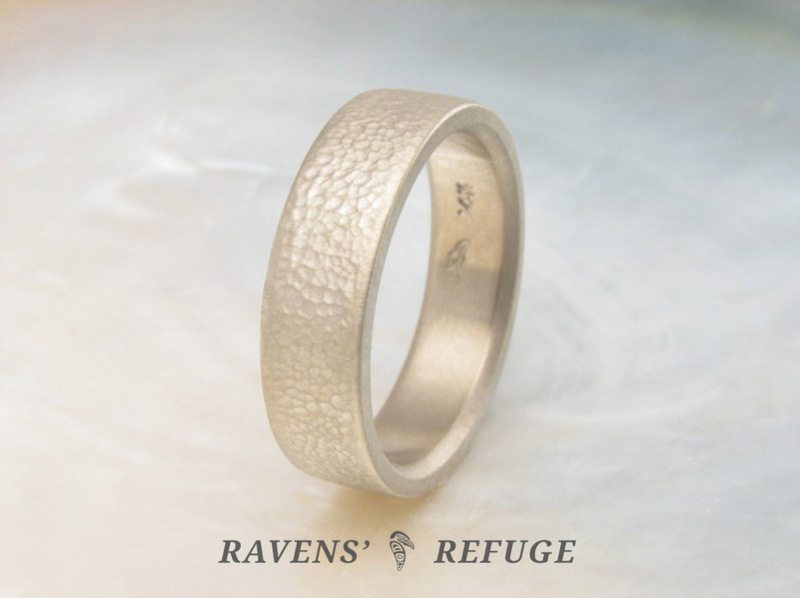 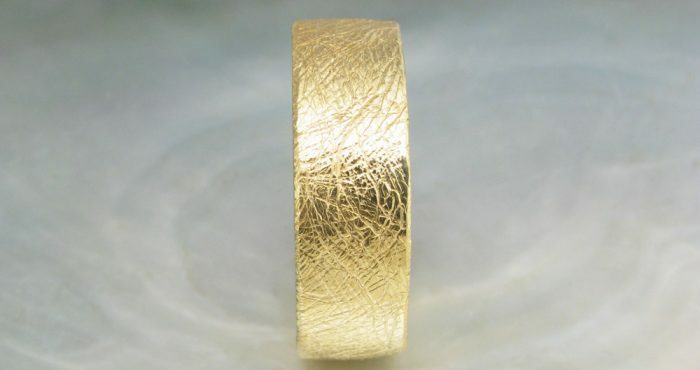 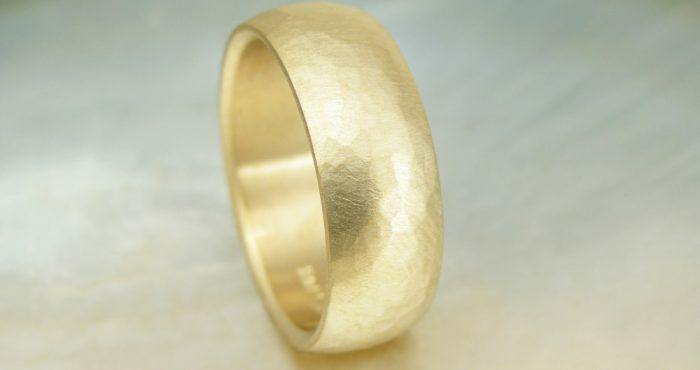 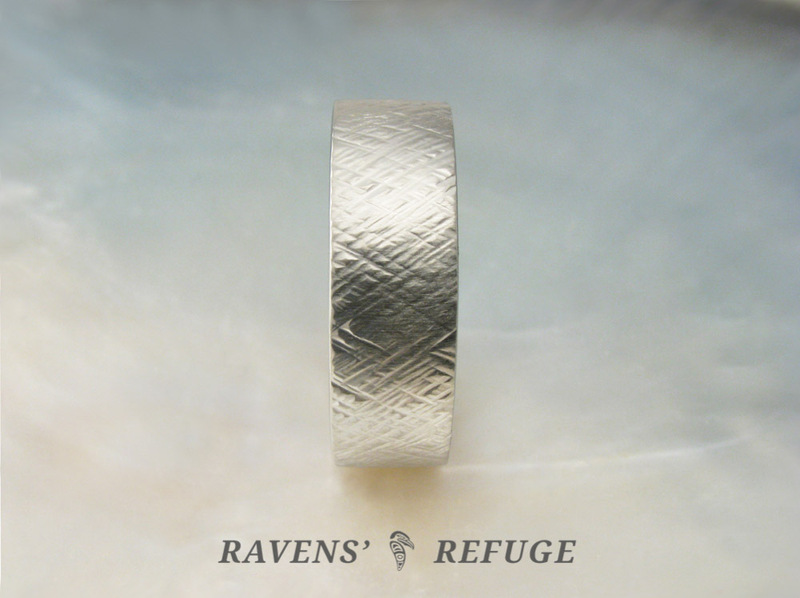 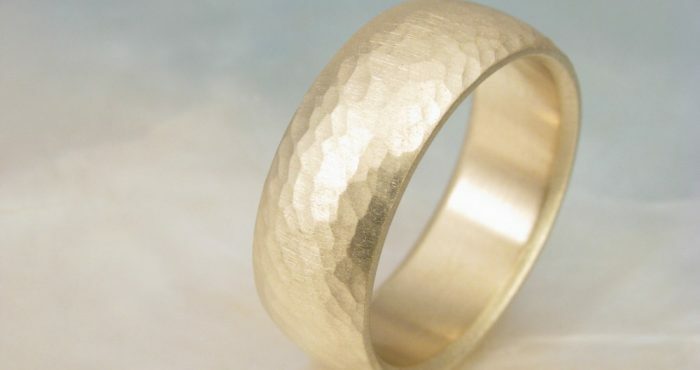 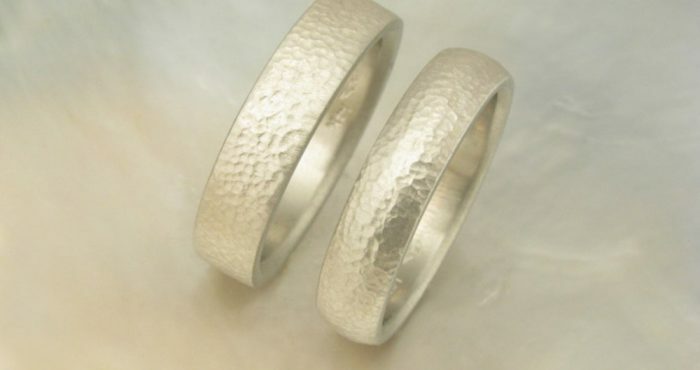 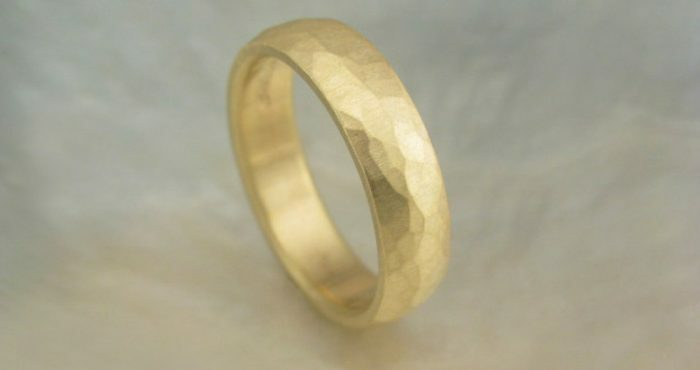 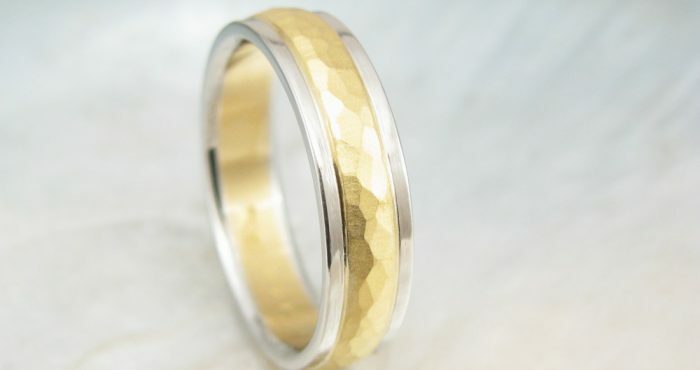 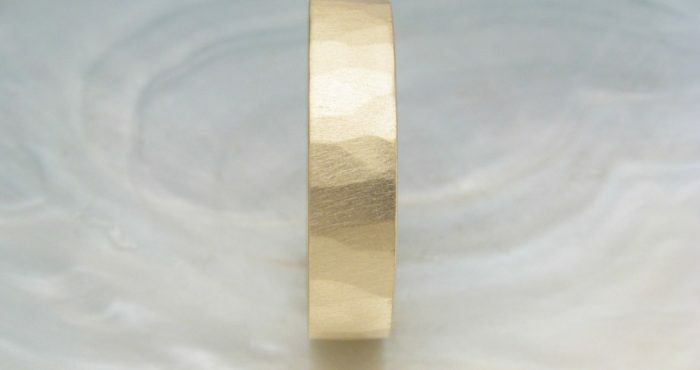 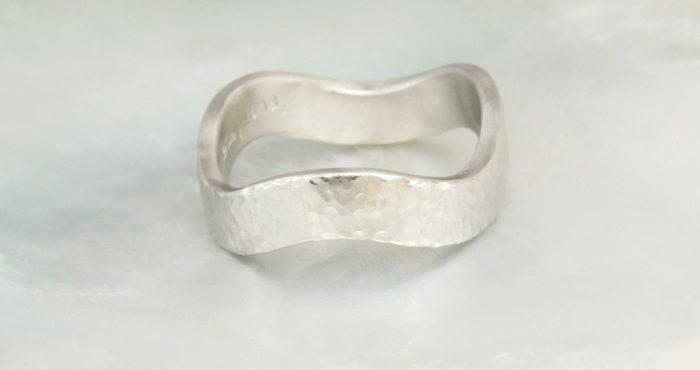 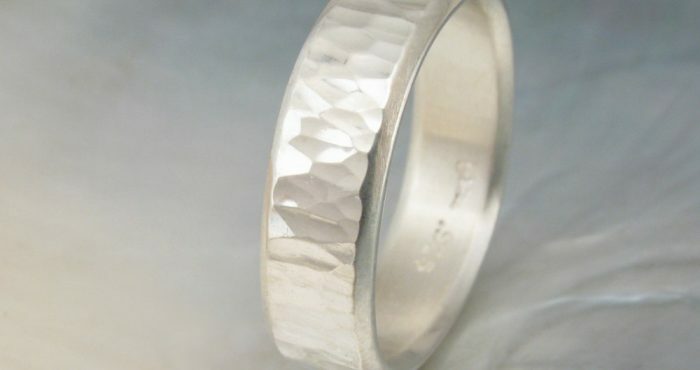 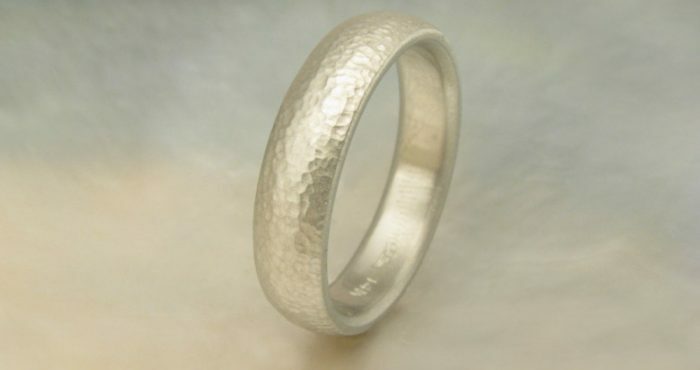 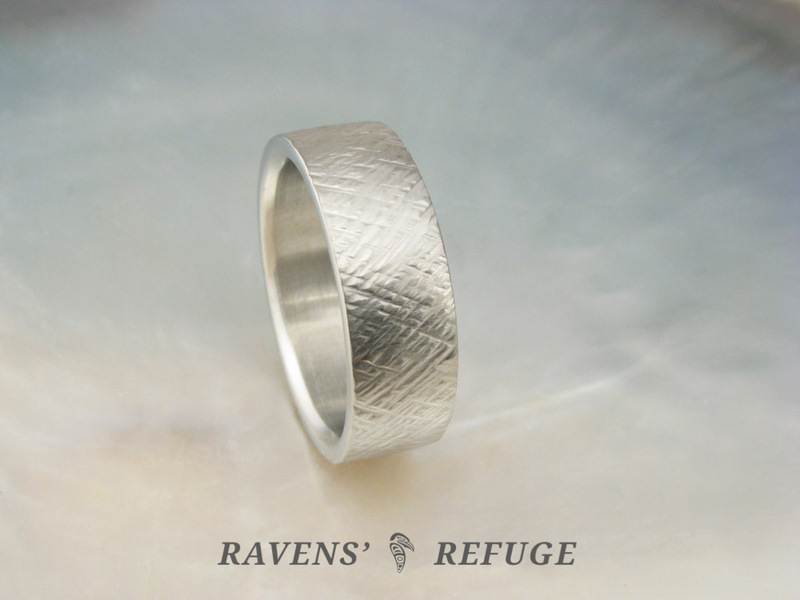 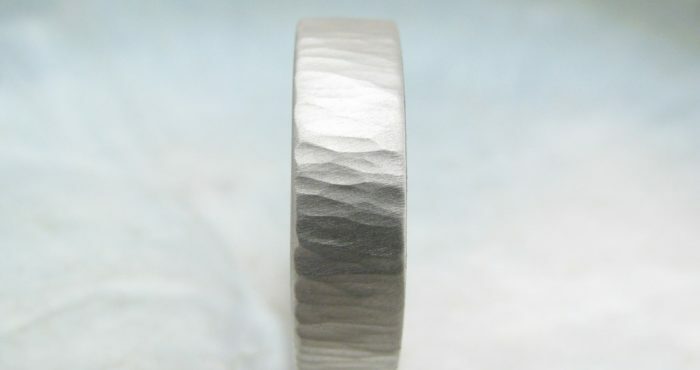 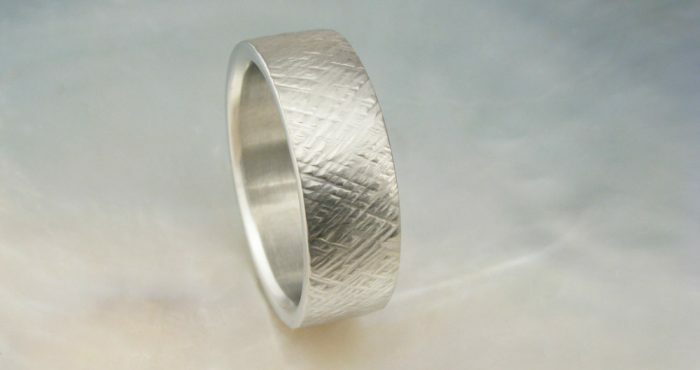 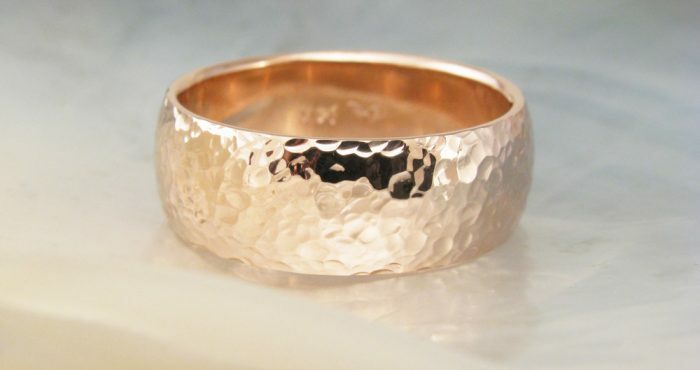 The twisted wheat hammering style offers a unique effect for a textured band. 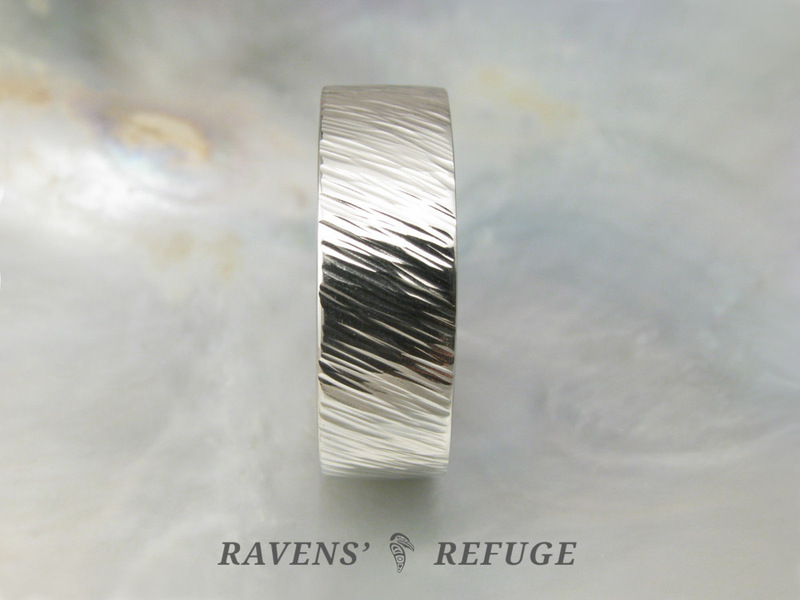 Its strong, graceful lines travel along the metal much like the gentle flow of wheat fields touched by a breeze. 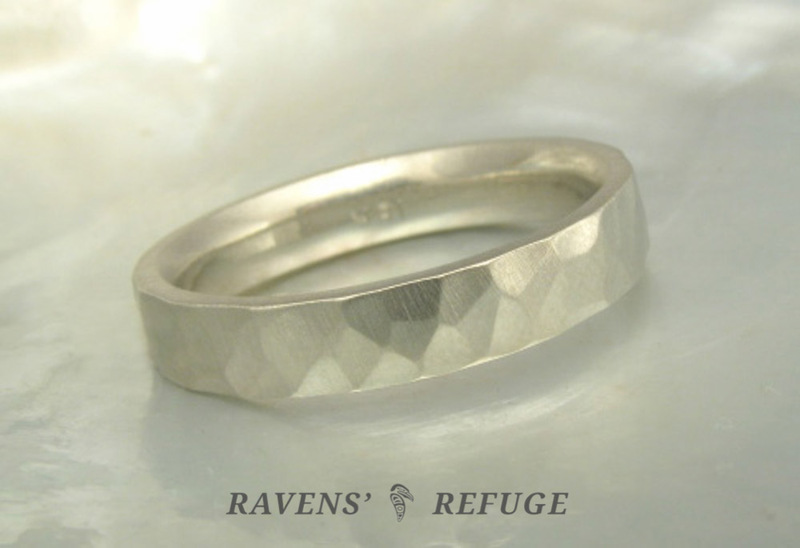 The lengthened facets are even, closely spaced, and struck on the diagonal. 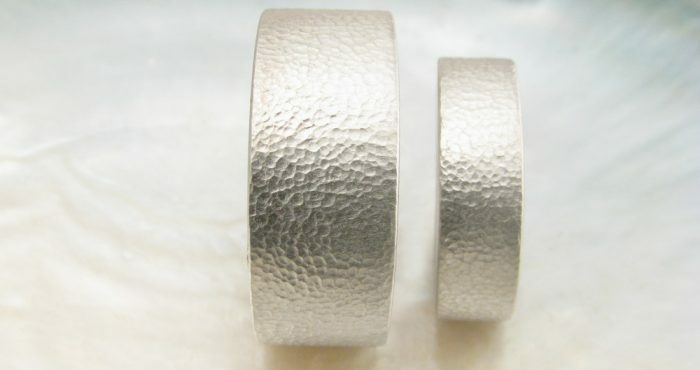 This style is available only for flat bands. 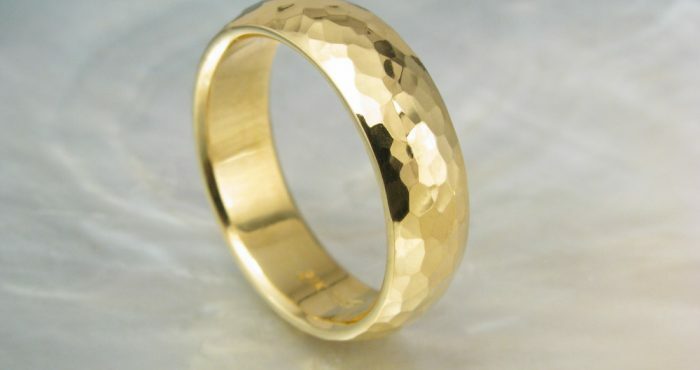 The waterfall hammering style is vertical and flowing, with an effect that tends toward a ripple of light rather than the multi-directional scatter of light created by typical hammered bands. 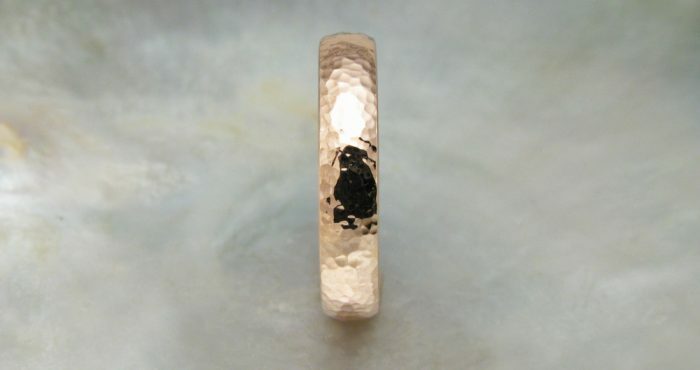 The light will appear to cascade across your finger as you turn your hand. 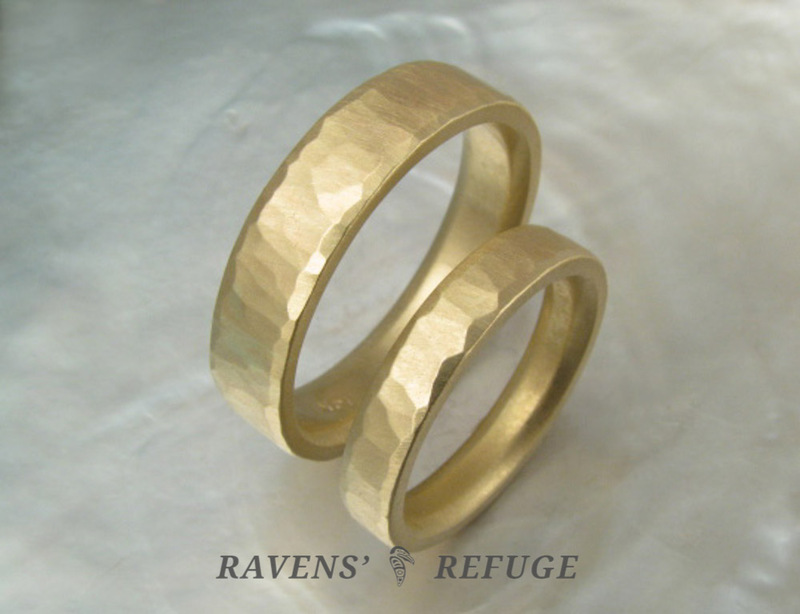 Inspired by woodland sticks and twigs, the wood grain hammering style lends a highly natural and organic texture to rings. 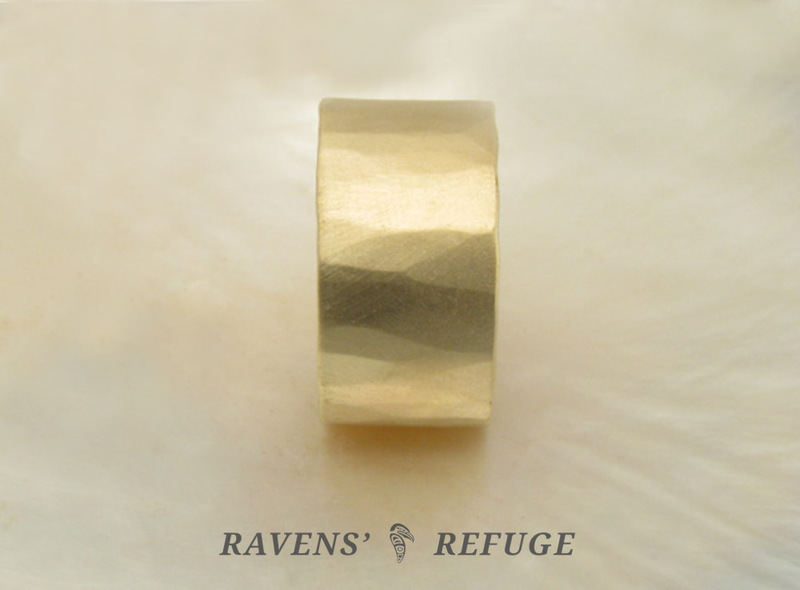 Its interlocking facets vary in size and placement, offering a rustic, earthy impression. 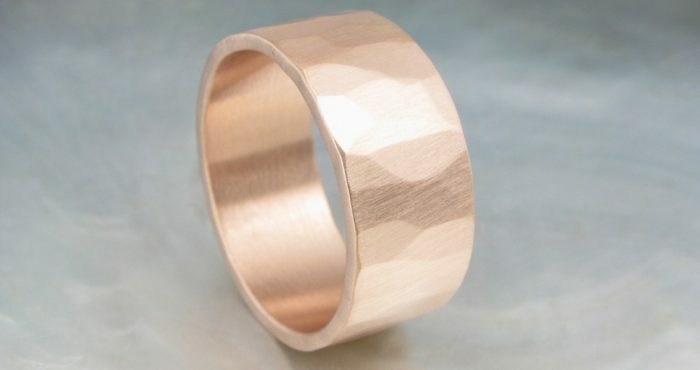 The resulting aesthetic is reminiscent of tree bark. 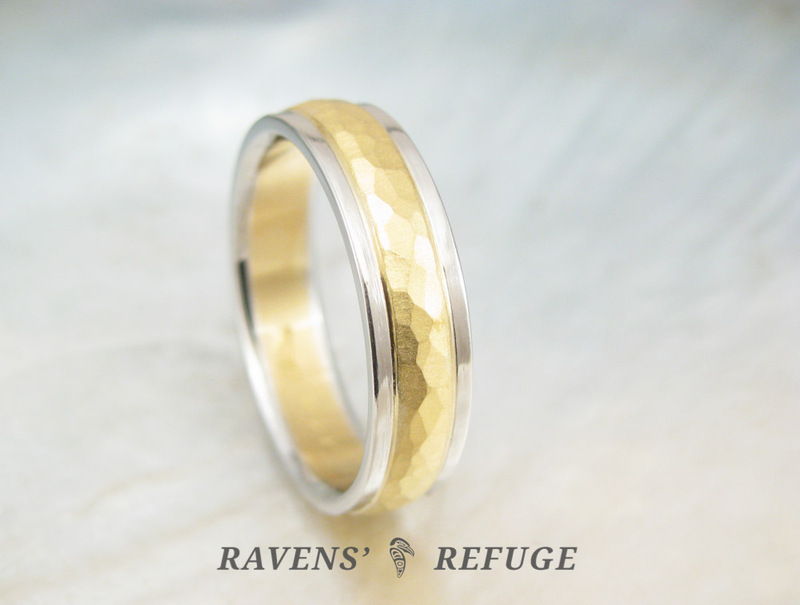 We recommend a flat band and a satin finish for this style.